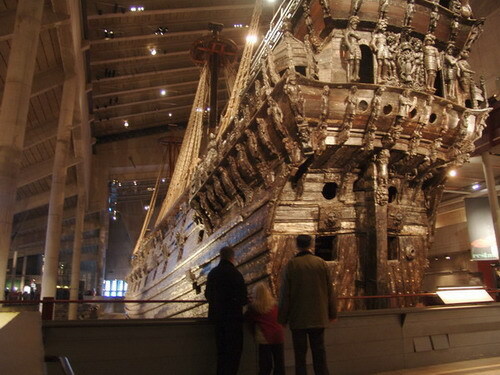 A monograph is being prepared at Vasamuseet. 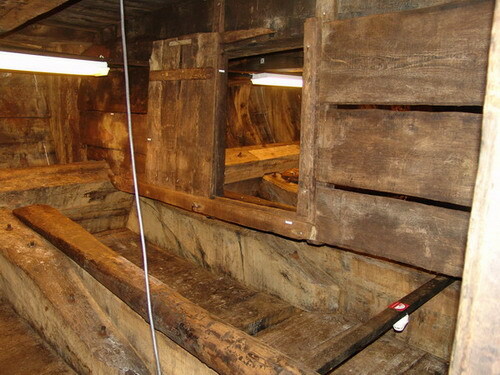 It is about Wasa. 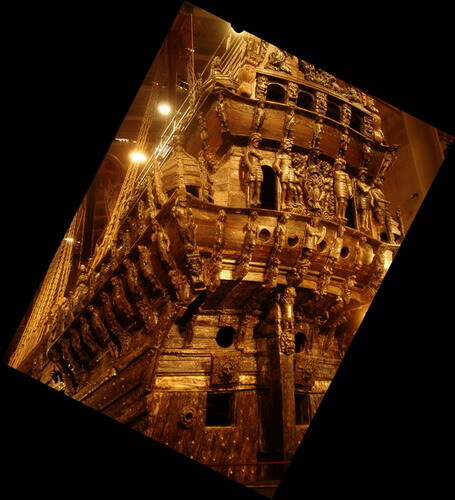 It will be composed of 5 books, 300 to 500 pages in lenght. 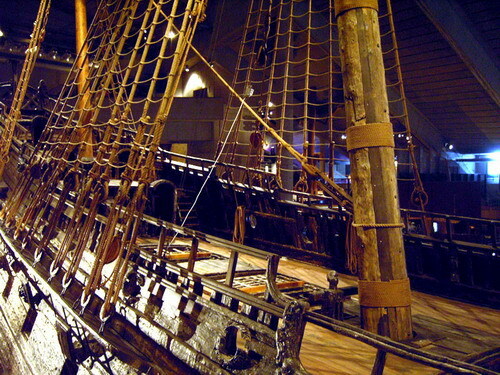 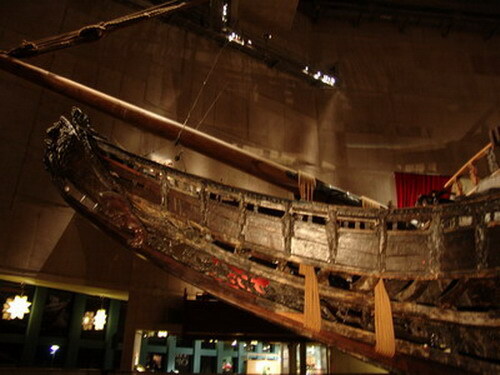 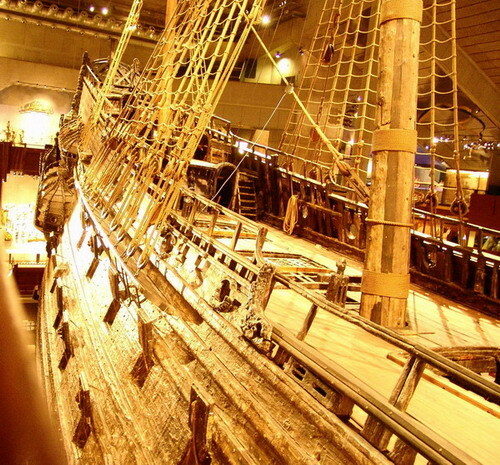 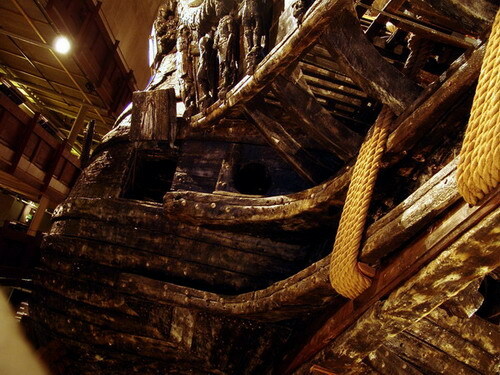 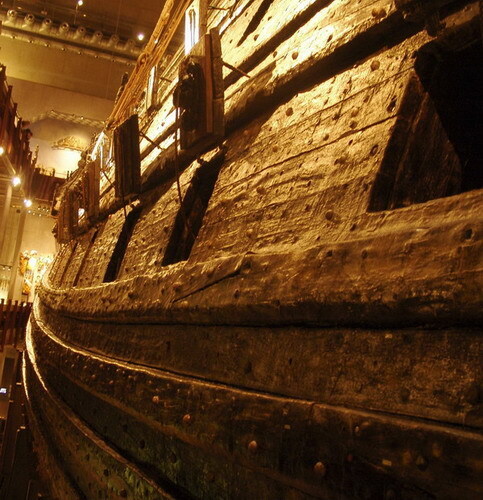 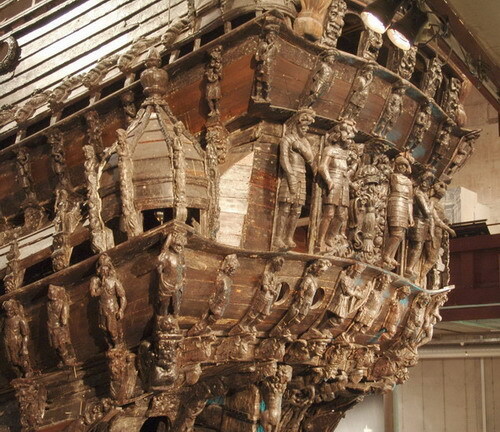 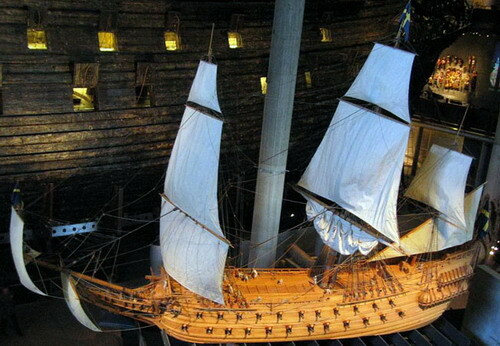 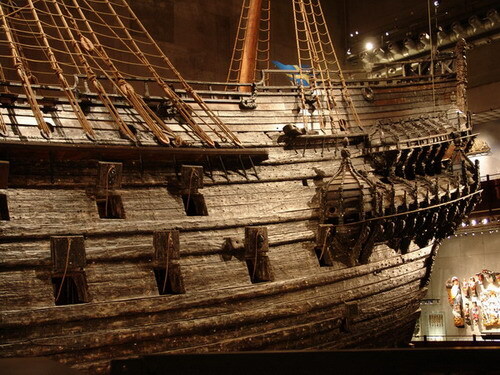 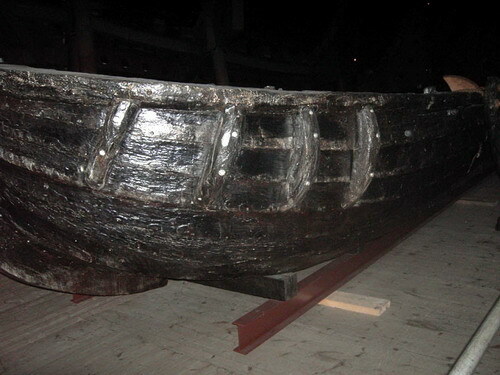 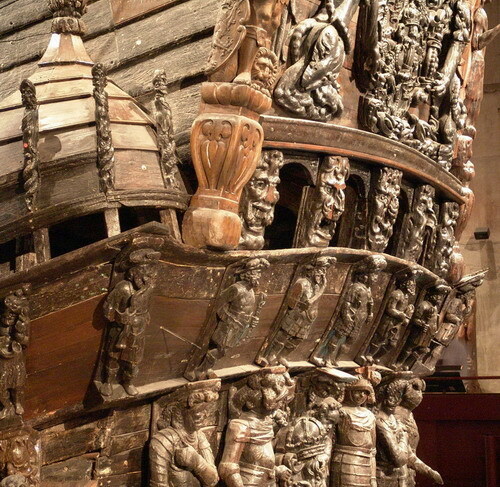 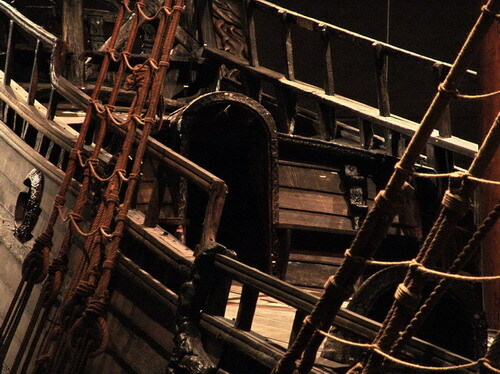 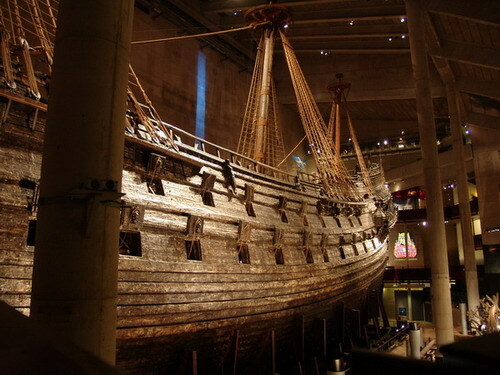 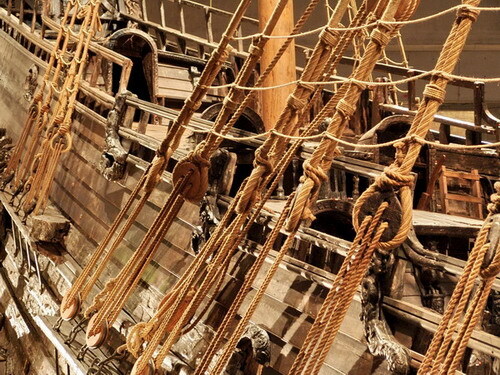 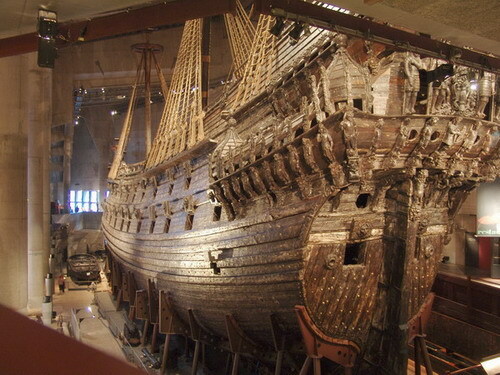 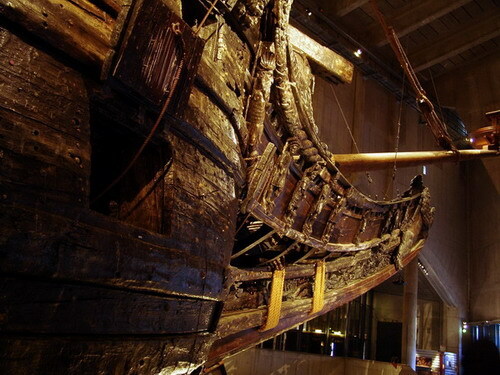 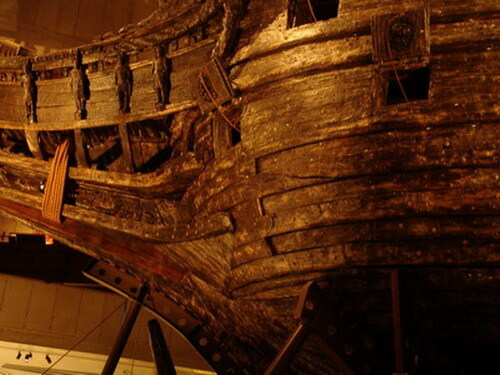 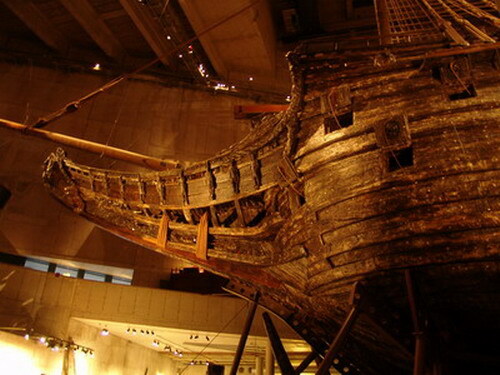 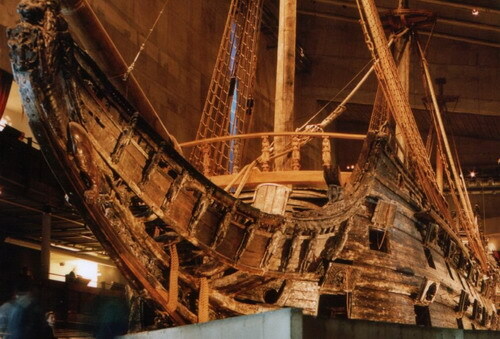 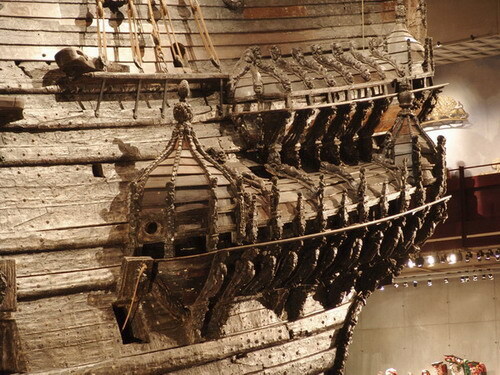 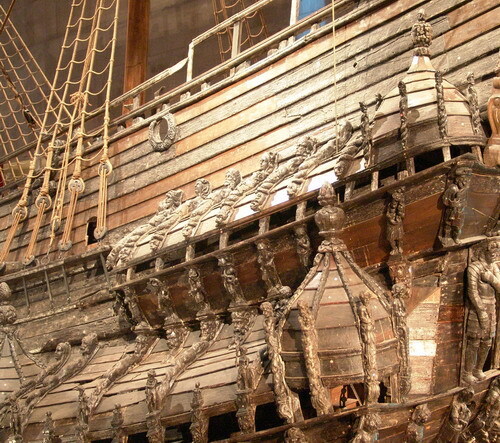 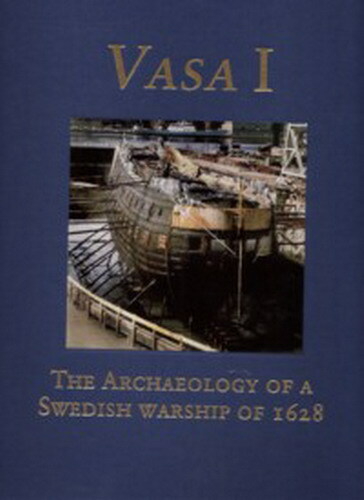 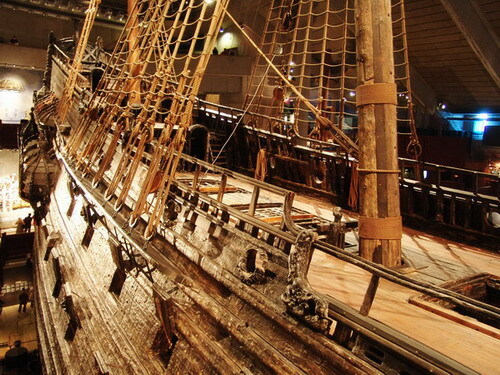 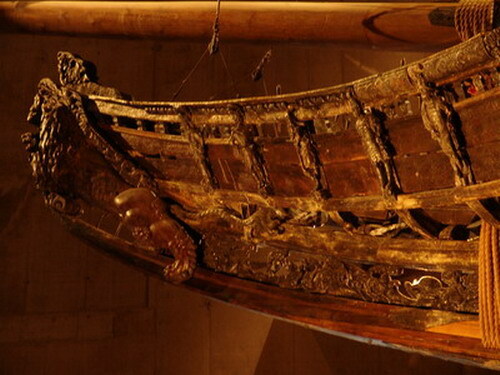 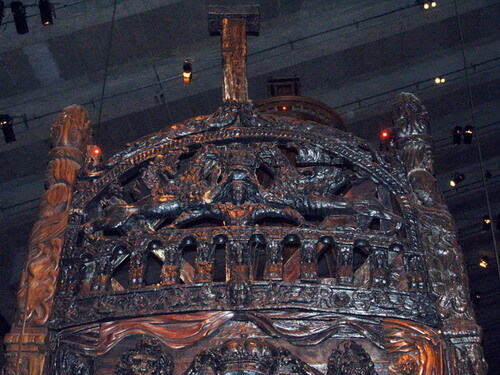 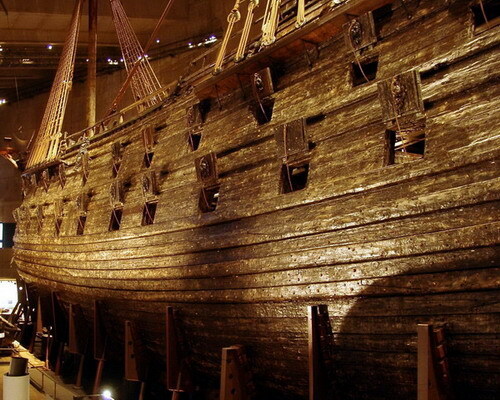 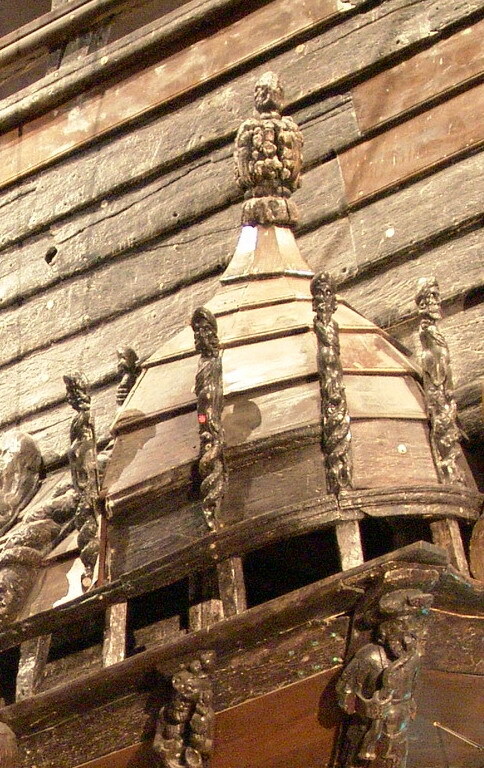 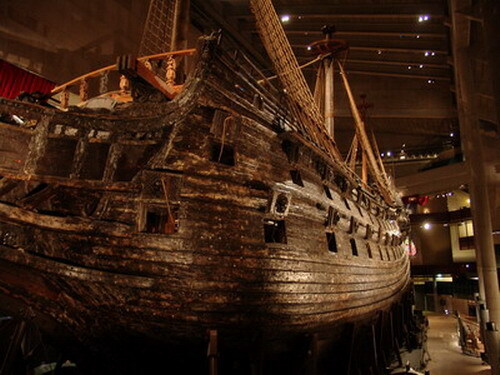 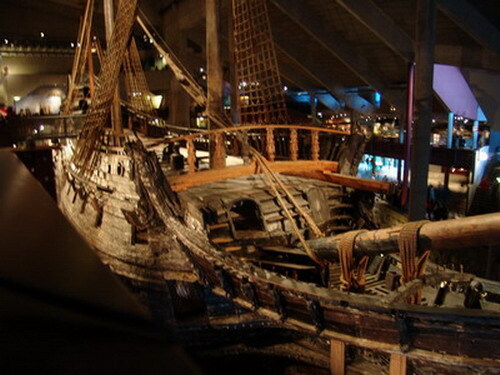 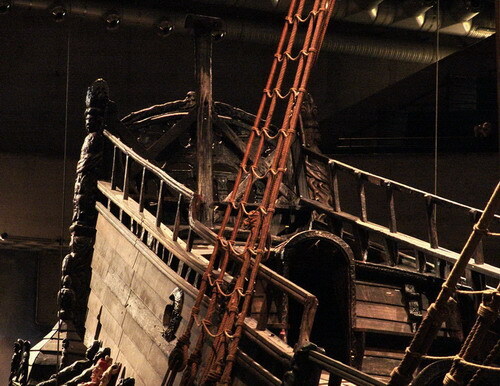 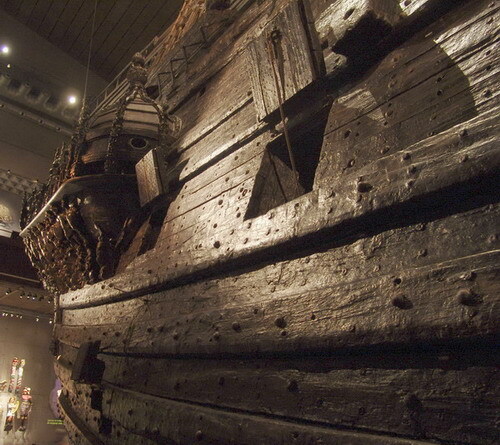 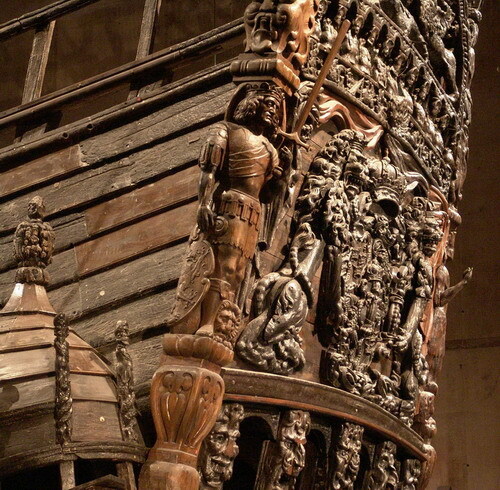 The first volume is titled : "Vasa I : The Archaeology Of A Swedish Warship Of 1628". 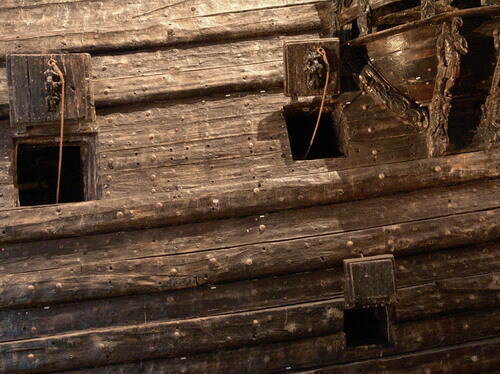 This volume is mainly about the wreck and the salvage. 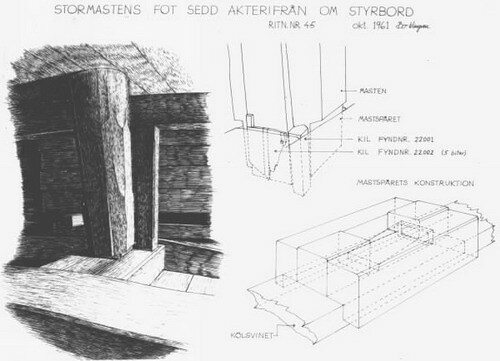 Carl Olof Cederlund, one of the salvors, is the principal author. 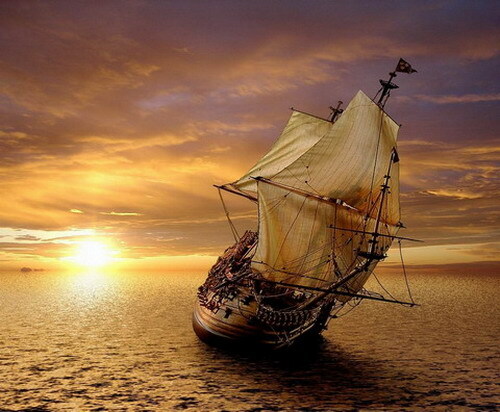 The rest is being prepared will be edited as time passes by. 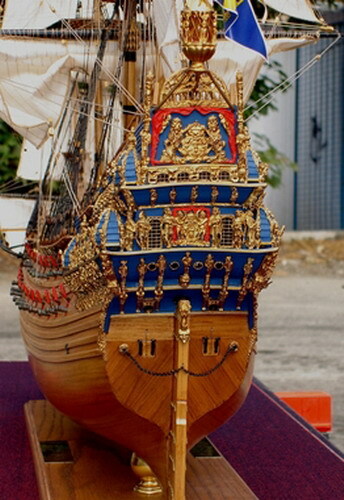 It is a great and beautiful work! 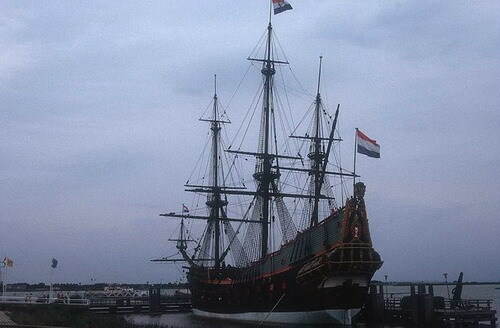 1 - The ship from port. 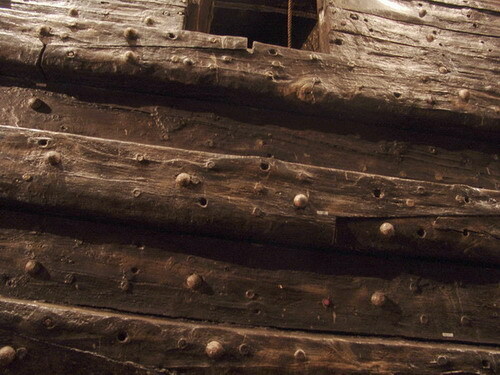 The spot marks the level of the stern. 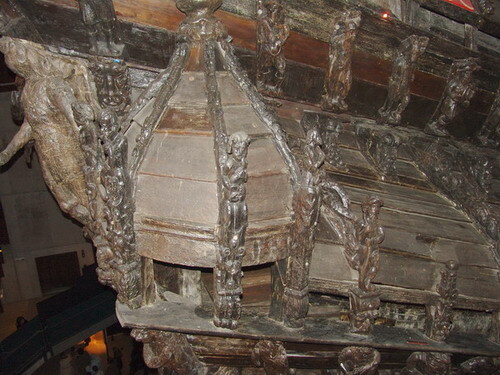 4 - Details of the inner structure. 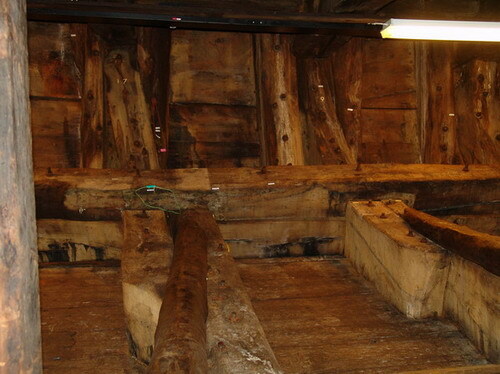 6 - Here we are in the starboard gallery. 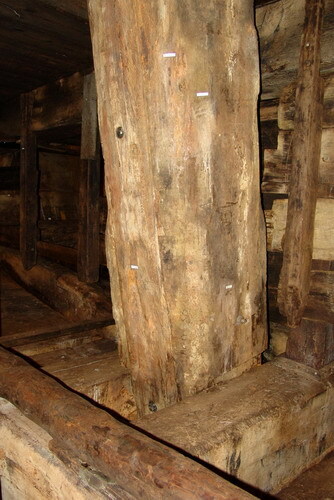 You can notice that the elements in the structure of the gallery have a very nice shape compared to the large timbers of the hold. 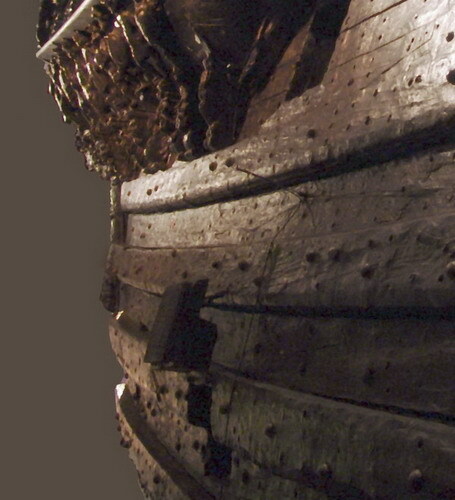 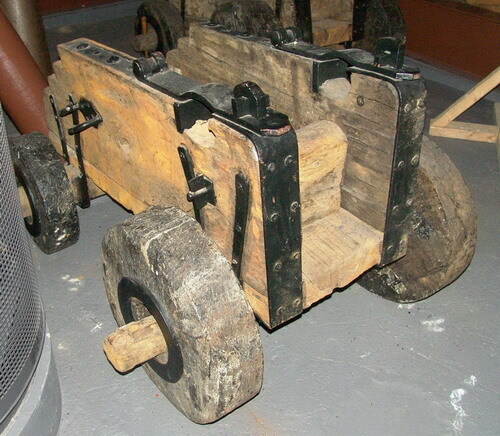 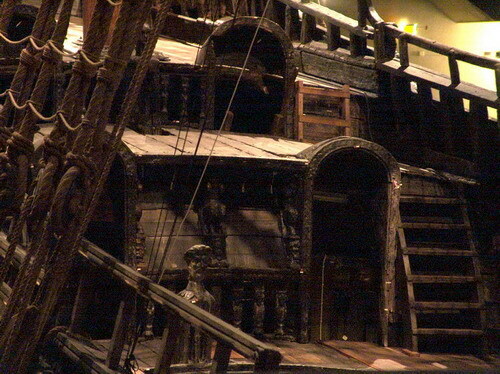 7 - Close-up of the starboard side. 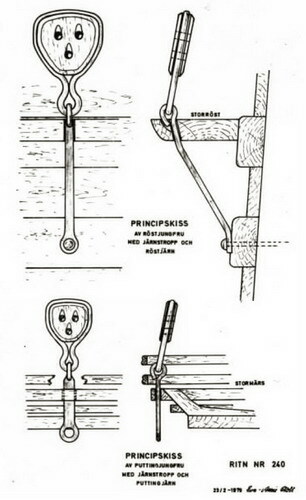 while the scarf joints are made with a hight precisions. 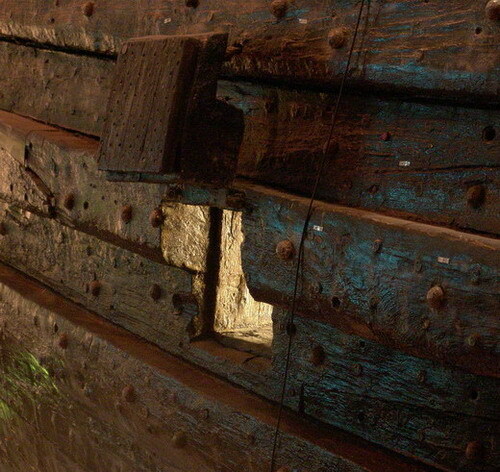 8 - In the hold. 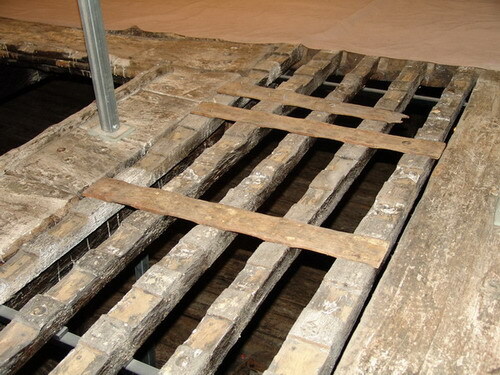 9 to 12 - This deck was deformed due to blasting rubble from the construction of nearby docks being dropped on the shipwreck. 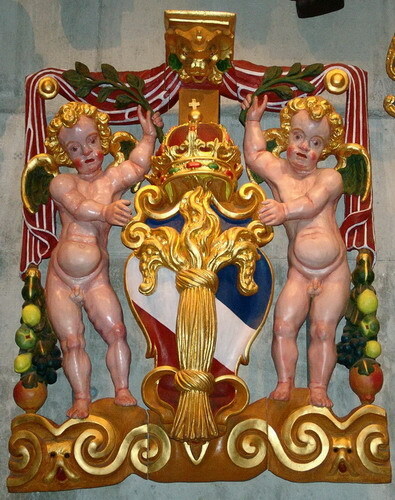 13 to 14 - The head. 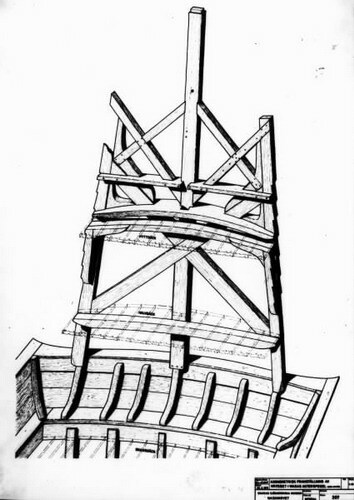 15 - Rake of the mainmast. 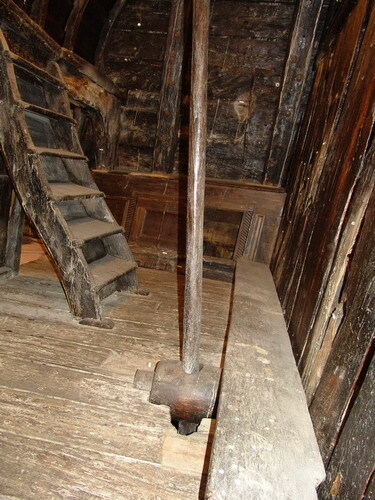 39 - Documentation on the mast step from Vasamuseet. 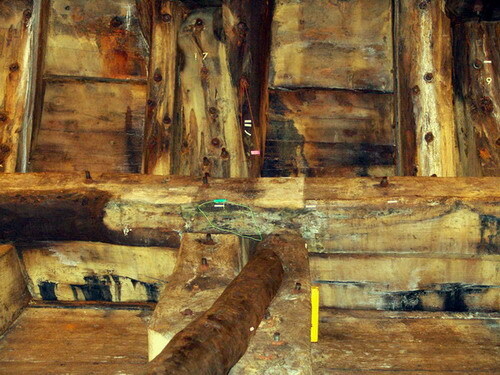 29 - These two railing elements are one meter apart in elevation. 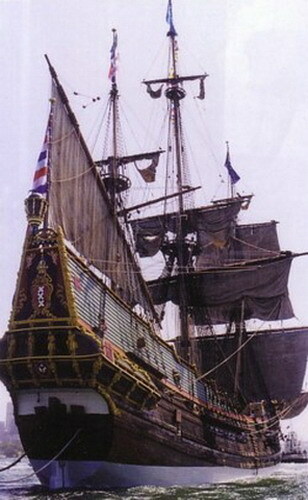 30 - Notice the rake on the main mast. 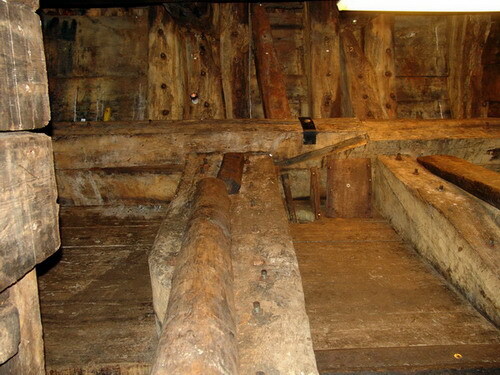 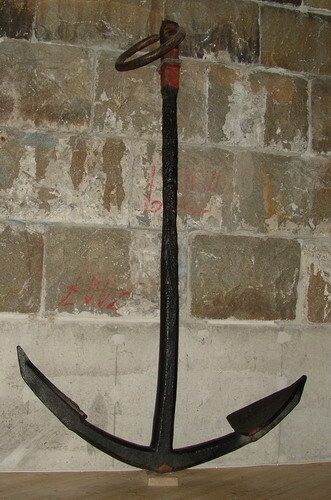 31 to 32 - Another interesting point is the mainmast rake verses the maintop tilt. 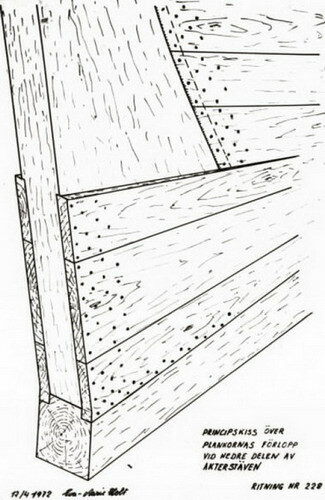 This makes the maintop difficult to stand on. 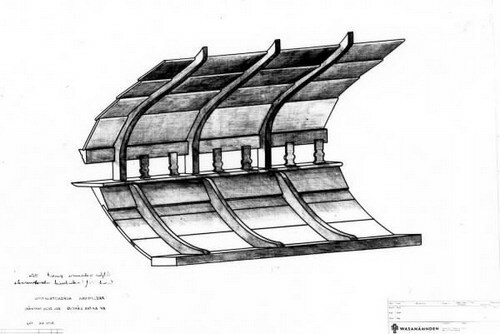 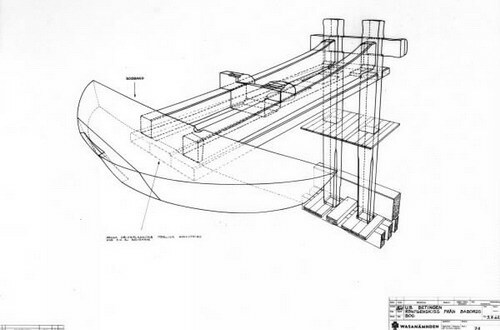 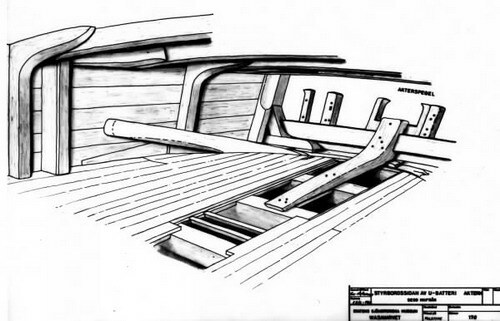 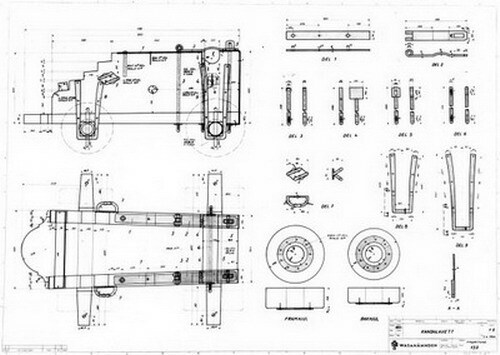 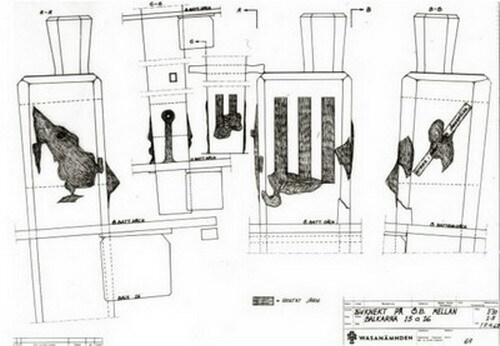 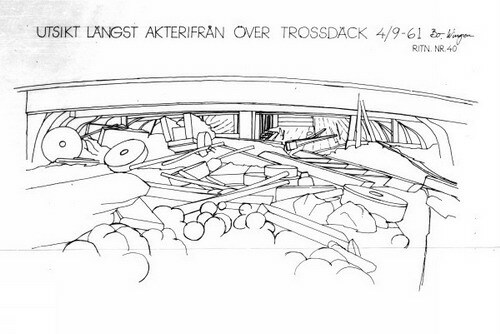 35 - This drawing was made in 1987 and shows the locations of framing timbers over a length of the ship. 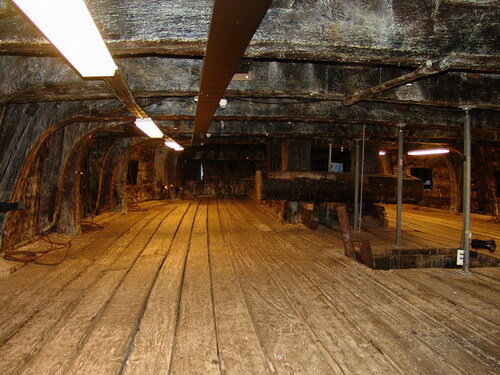 36 - Looking carfully, you can see that the deck-beam over the bitts has sagged down. 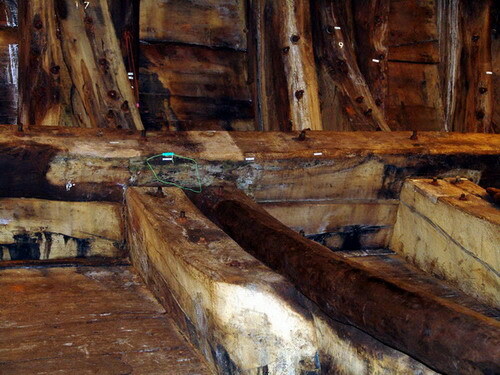 37 - Check points and distortion of the hull: to see how the hull has moved over the years, 400 controlled points were placed to make 14 series of measurements possible. 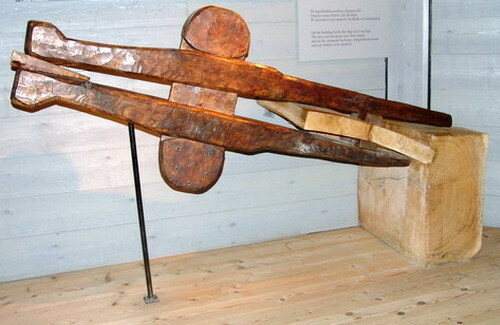 38 - Changes in shape of the stern between october 2000 to april 2005. 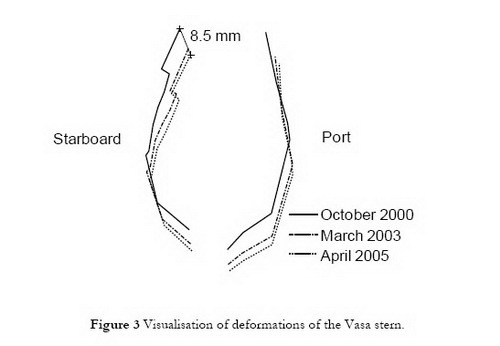 For clarification, the scales of the mould and the deformations are disproportional. 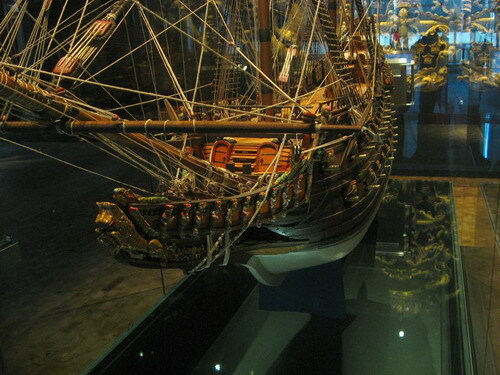 41 à 47 - Few exemples of archive data from Vasamuseet. 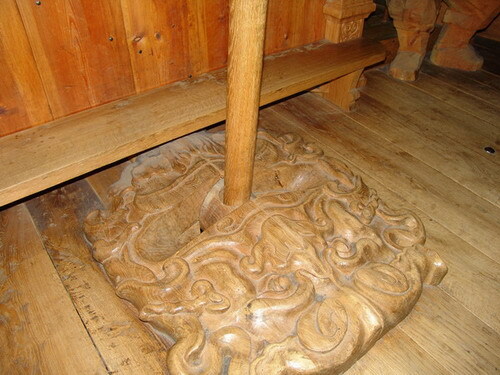 48 - These two knees are separate and have been shaped from a natural tree fork. 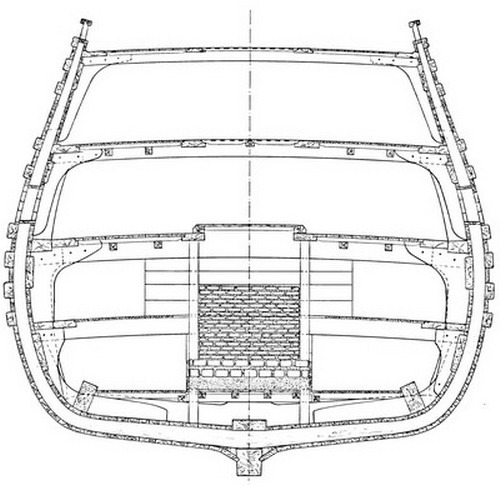 Because of the necessary dimensions, knees are composed of two parts attached to the keel. 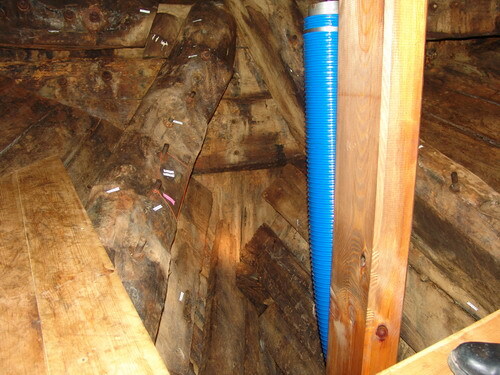 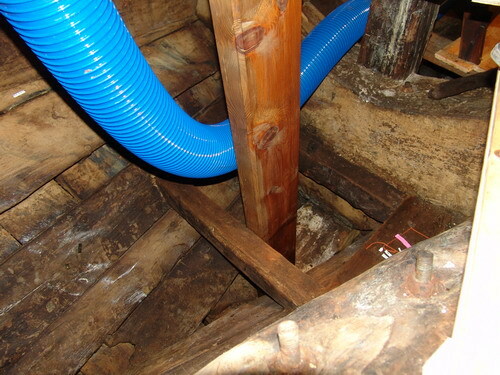 49 - The blue flexible pipe is used to circulate conditionned air in the hold. 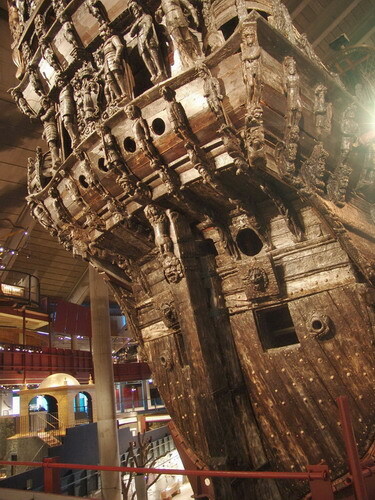 50 - Vasamuseet archive data concerning the maintop. 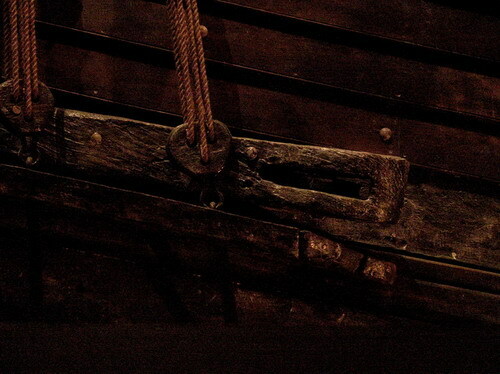 56 - Life on board. 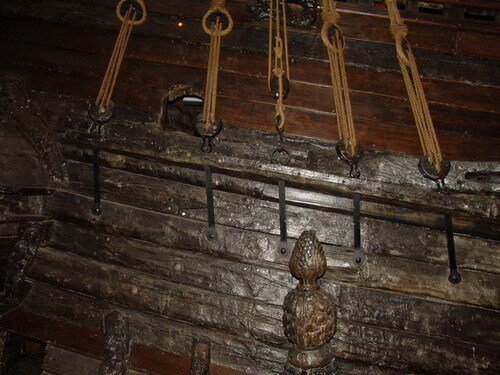 59 - Door of the admirals cabin.(Reconstruction). 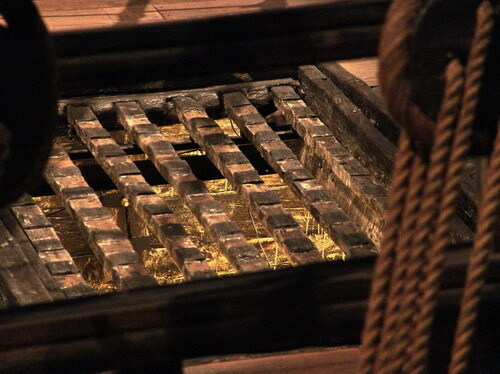 60 - Underside view of some weather deck grating, from two decks below. 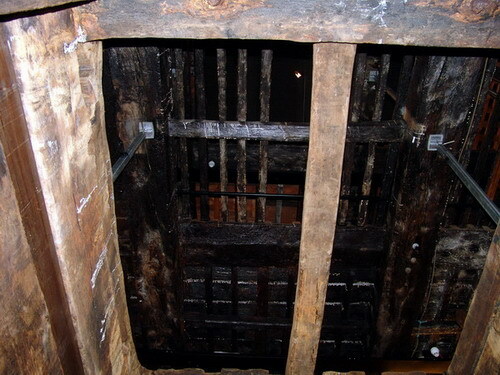 61 - In the hold. 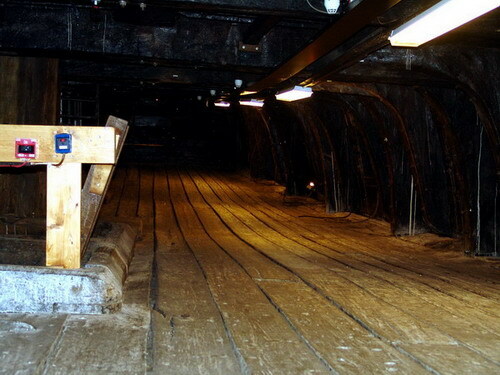 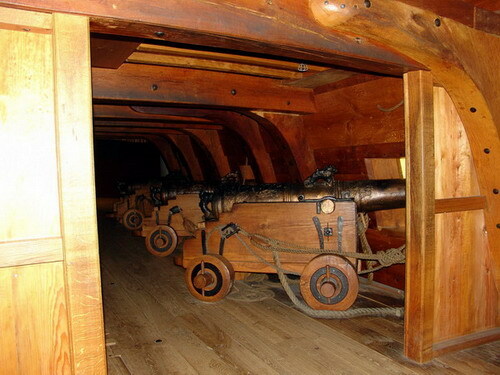 62 - Section of the upper gun deck. 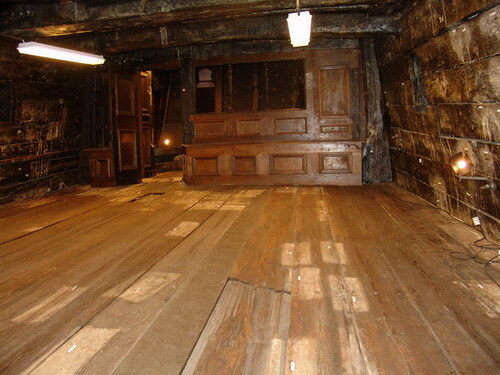 63 - In the captain’s cabin. 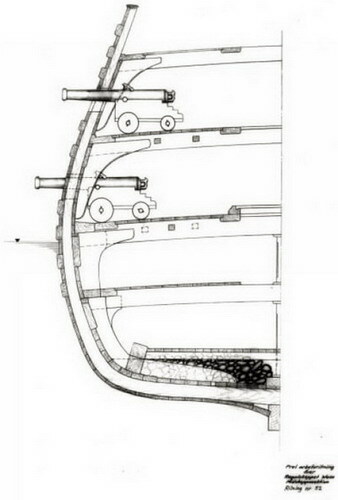 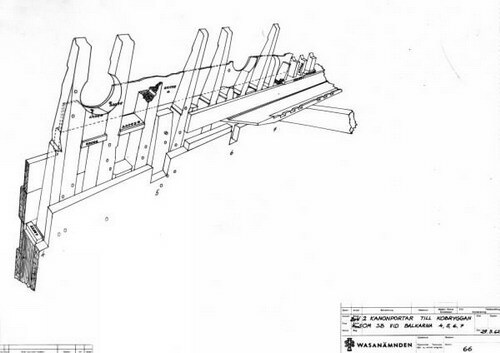 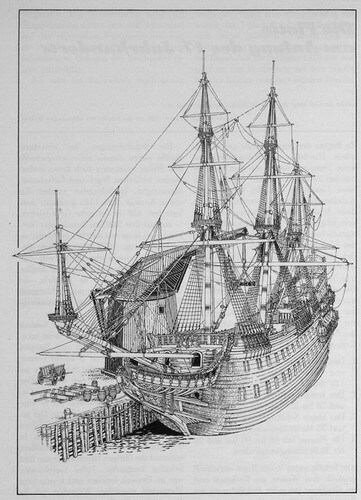 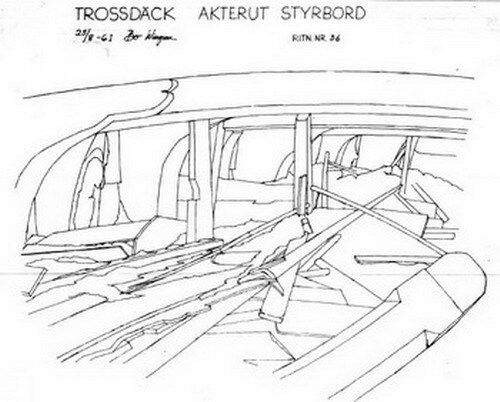 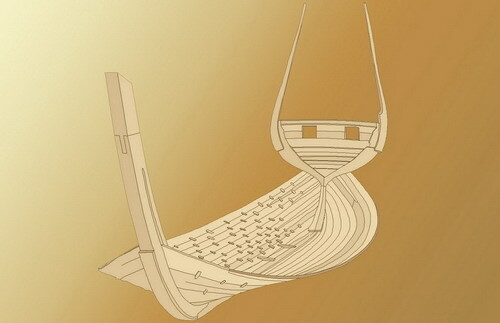 64 - Cross section of the ship from the Vasamuseet plans. 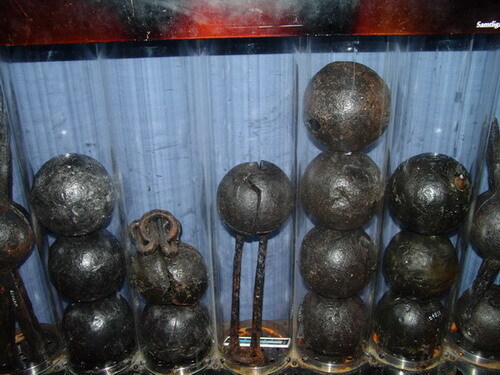 70 to 73 - A quantity of cannon-balls in different shapes. 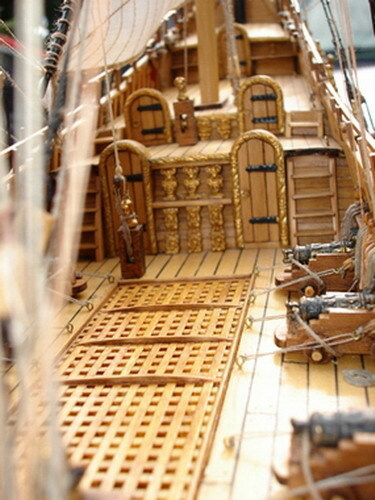 Men always have a good imagination to create these kinds of toys. 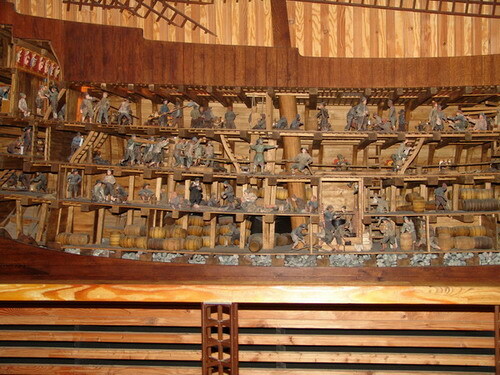 Looking at the following pictures you can see the great comraderie between sailors of these battleships. 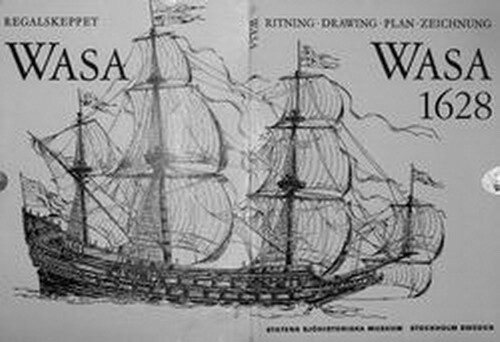 74 - The fabulous and long voyage of the Wasa. 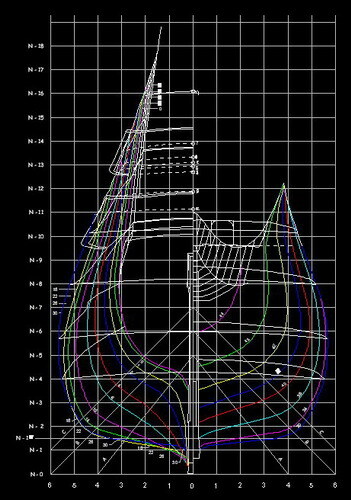 75 to 78 - "The infernal puzzle"
79 to 87 - Spots of the stern. 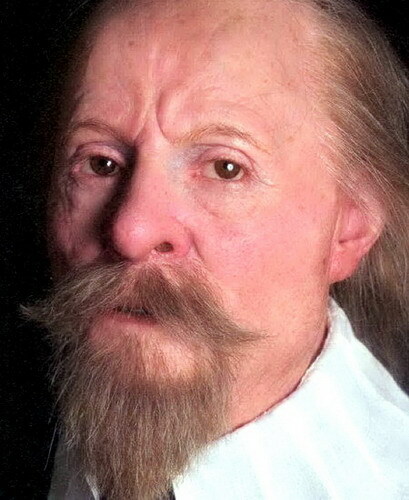 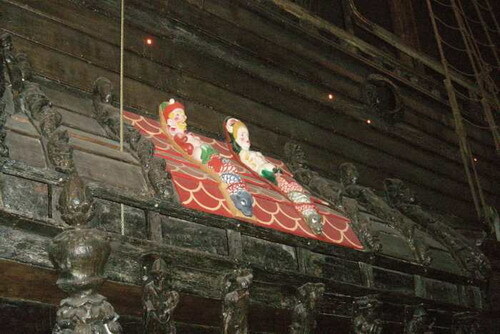 Pictures of reproduced carvings painted as they were in 1628. 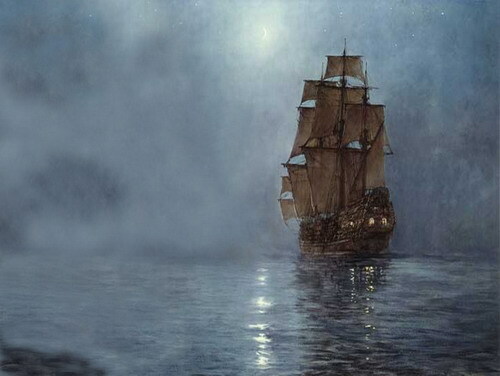 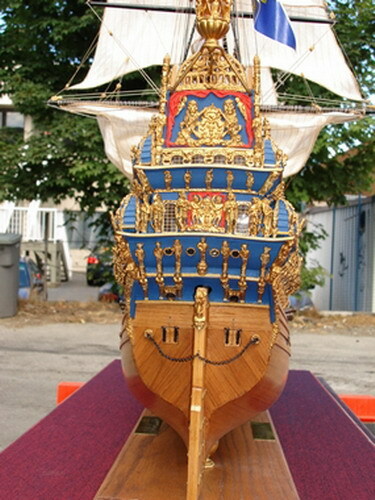 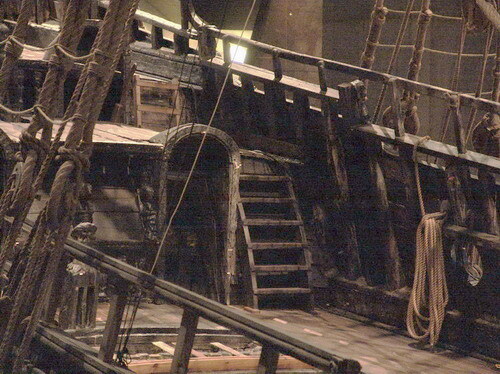 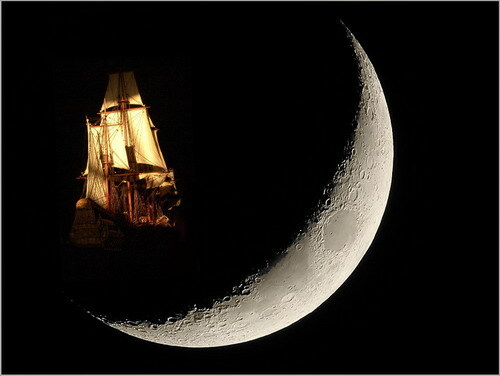 All carvings were painted, and the ships upperworks were painted red, contradicting the idea that they were blue. 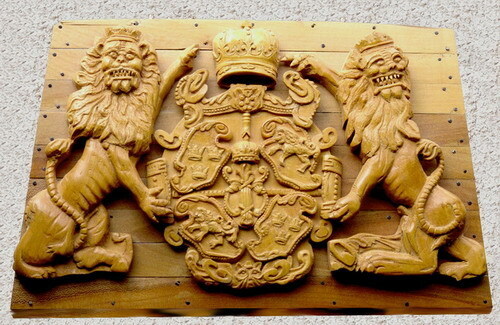 88 - Wasa family shield with wheatsheaf. 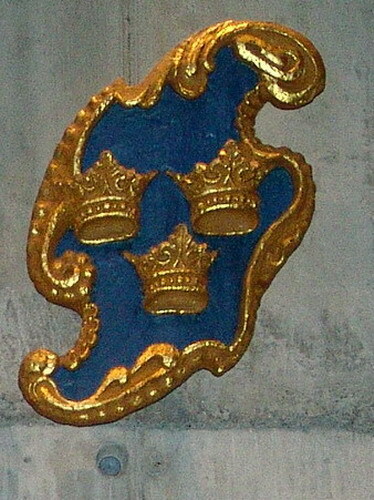 89 - The three crowns (Tre Kronor) emblem of the Swedish monarchy. 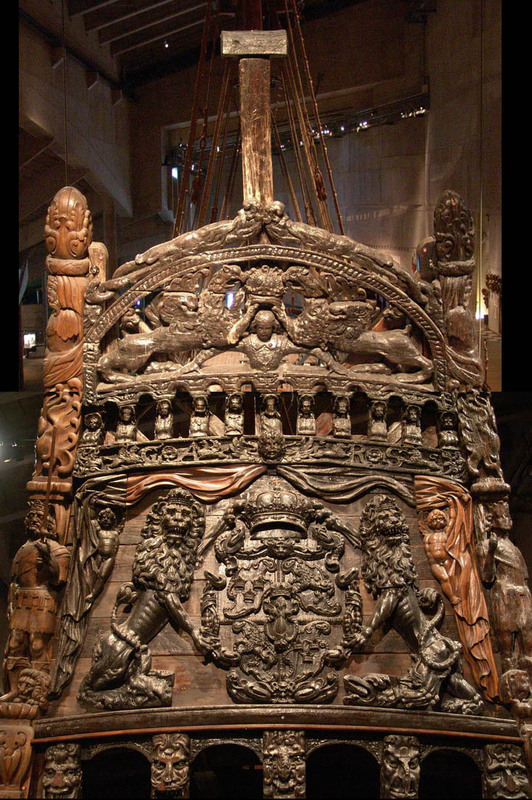 90 to 95 – Different types of carving include Roman warriors, tritons, nereides and consols. 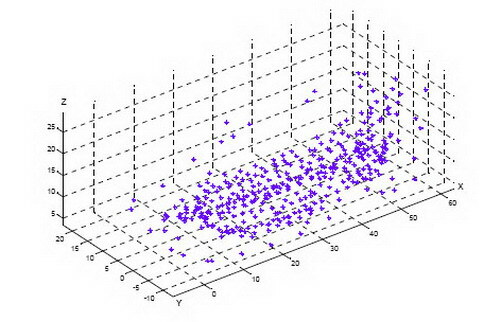 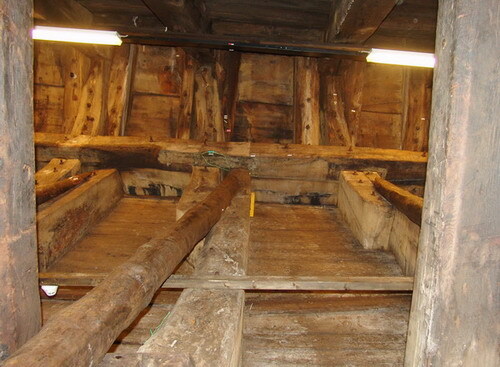 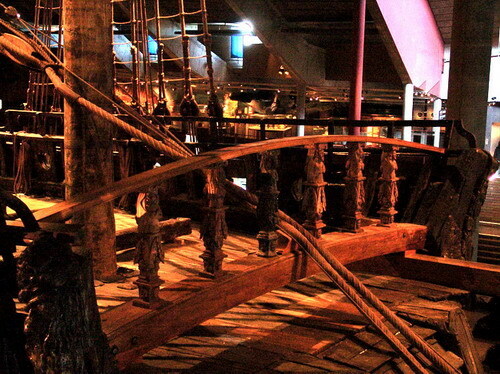 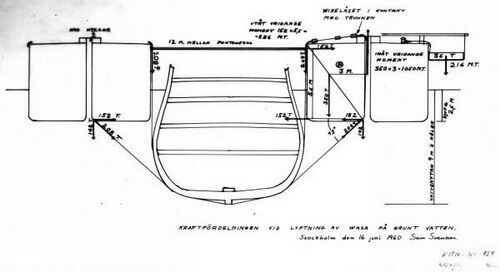 we can easily see how the Dutch method of shipbuilding was conducted. 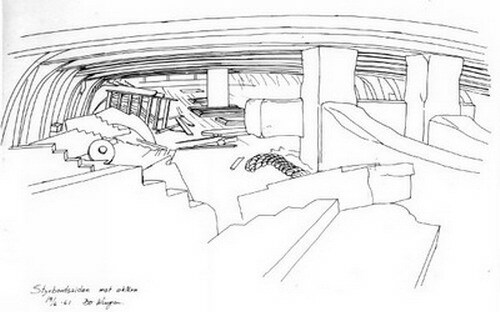 97 and 98 - Two drawings that define the shape of the Wasas hull. 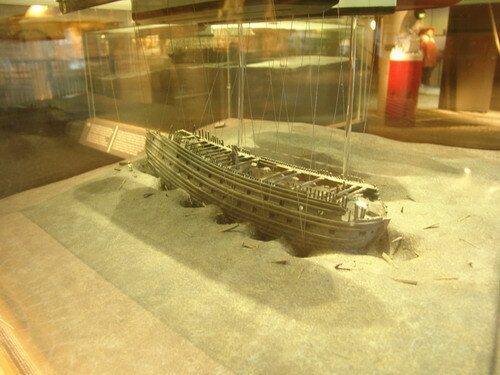 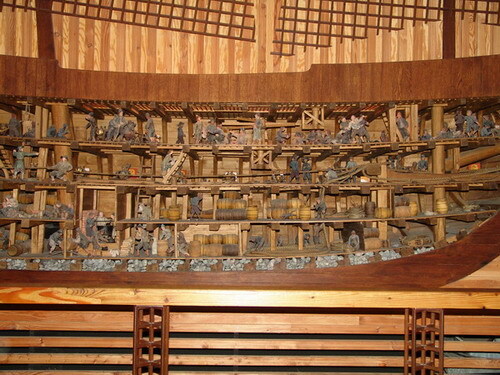 104 to 106 - Diorama of the Royal shipyard. 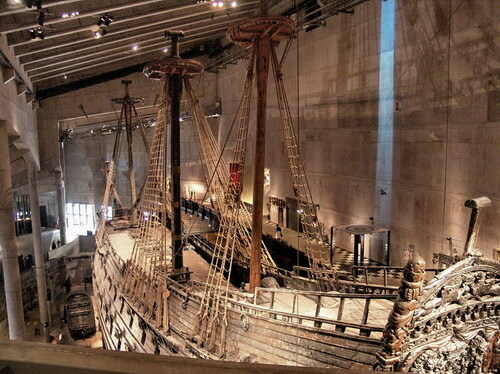 Vasamuseet. 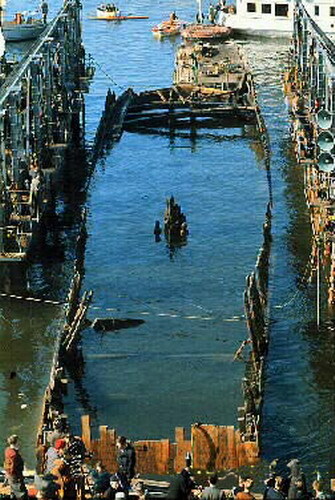 107 - Level of the silt on the bottom of Strommen in which Wasa sat. 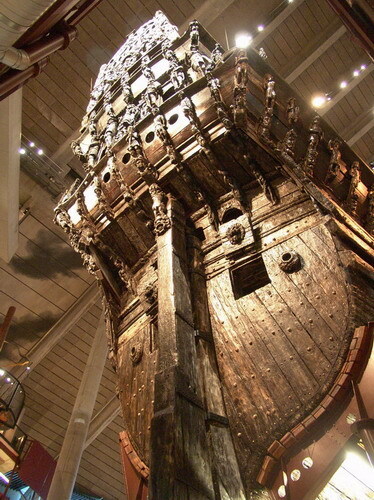 108 to 115 - Manuscript data that came from the Vasamuseet archives. 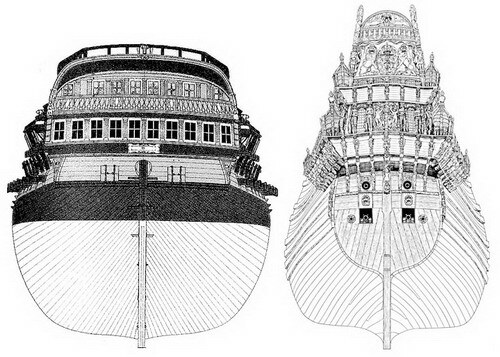 Drawings that were made after raising the wreck. 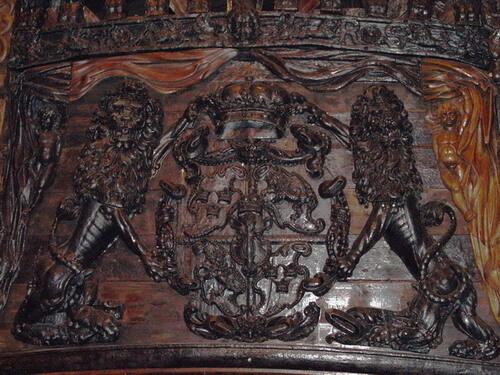 The carvings are Roman emperors. 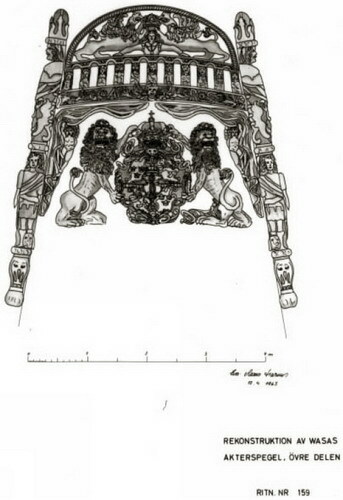 134 - Lion mask attached to the inside of the gunport lid to scare the ennemy when openning. 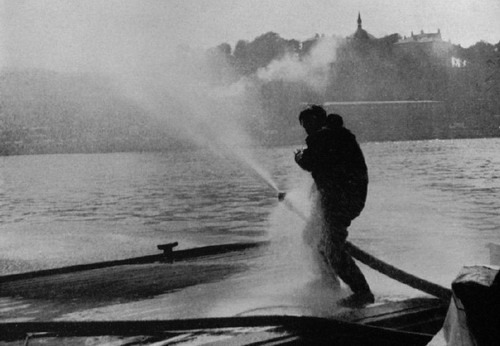 There were 56 but we have only 48 today. 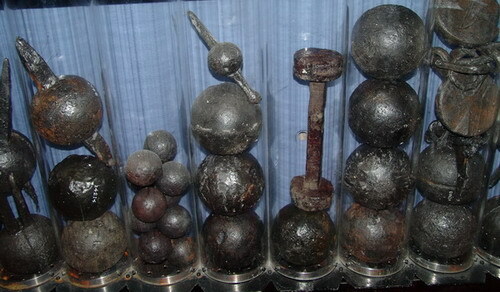 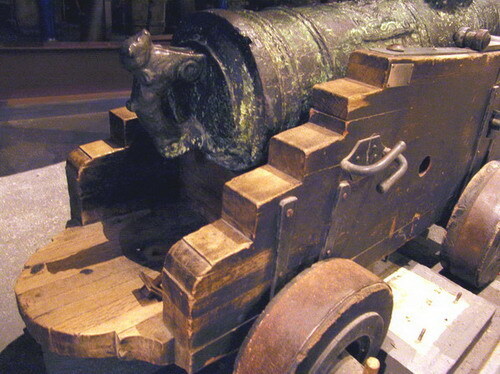 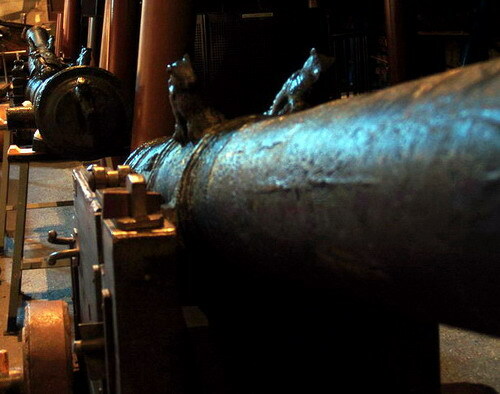 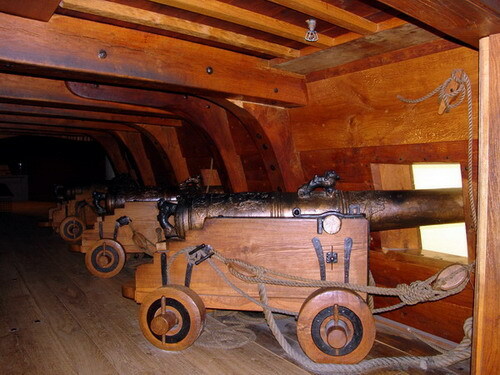 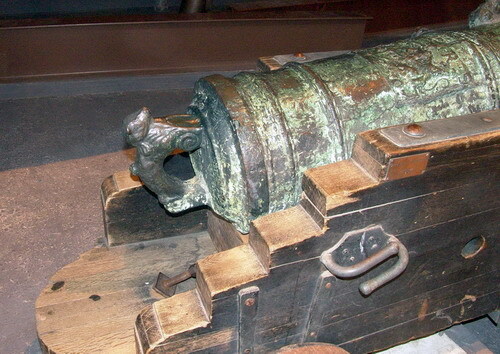 135 to 140 - Only 3 guns where found on the wreck since most of the guns were salvaged quickly after she sank. 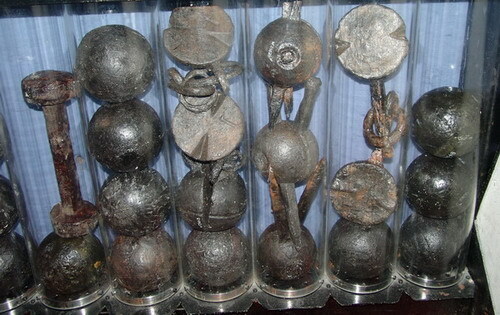 For salvage, a diving-bell was used since the ship sunk in 32 meters of water. 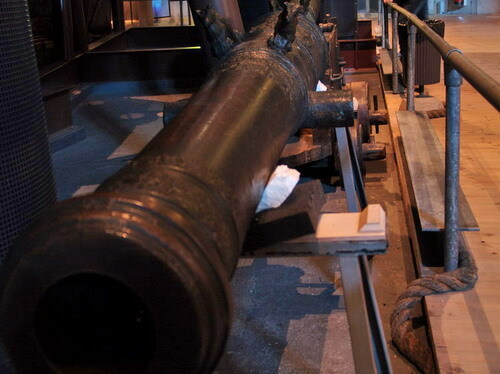 A large part of the guns have been sold to Germany. 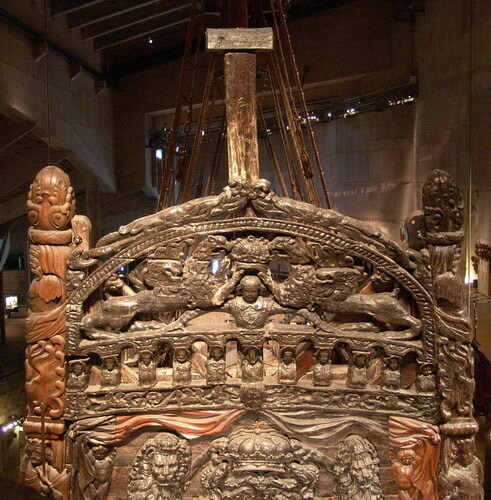 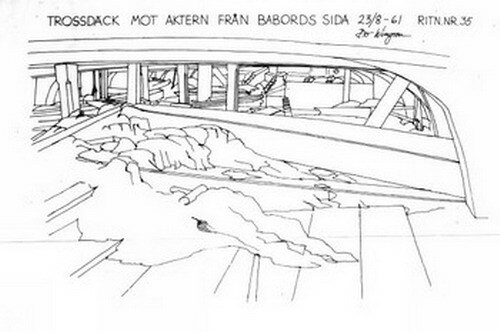 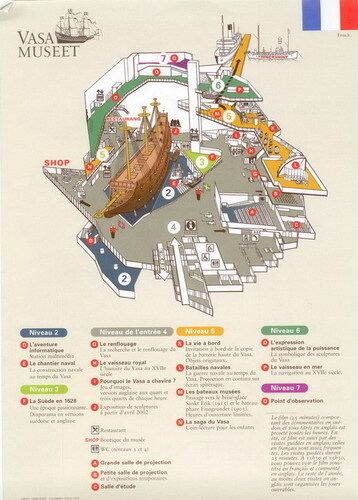 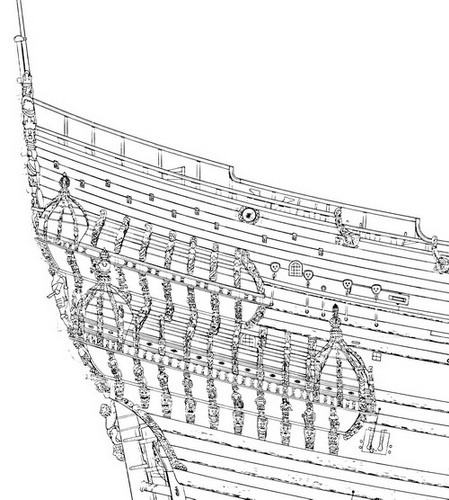 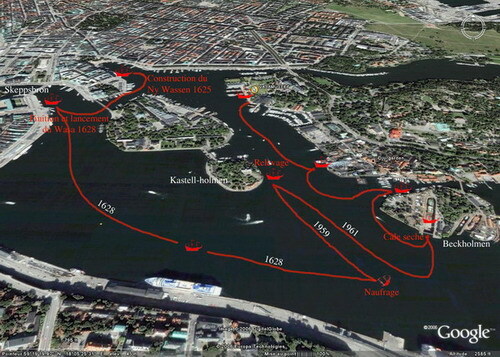 Plans of the carraige are from Vasamuseet data. 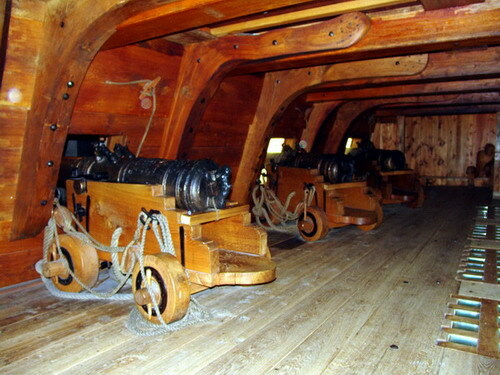 487 to 503 - Guns and carriages. 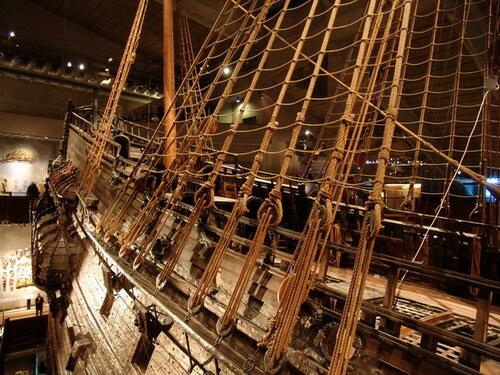 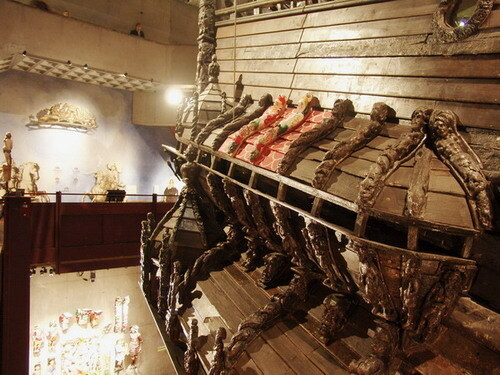 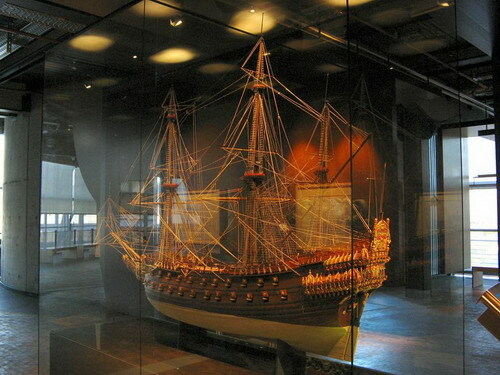 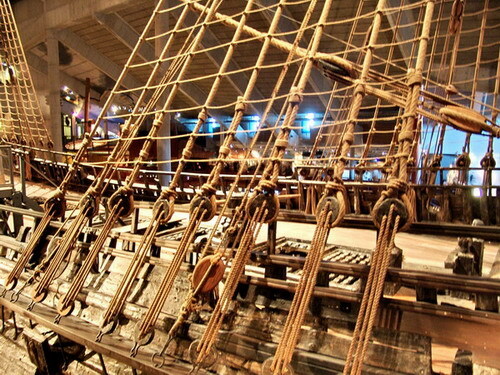 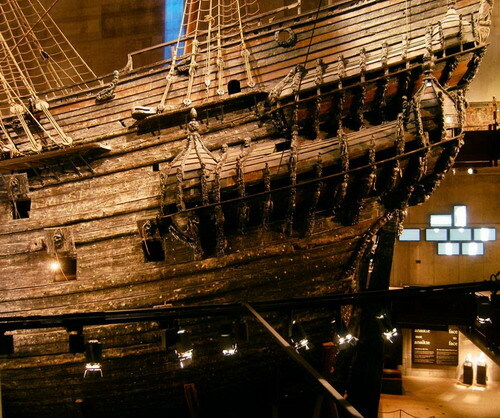 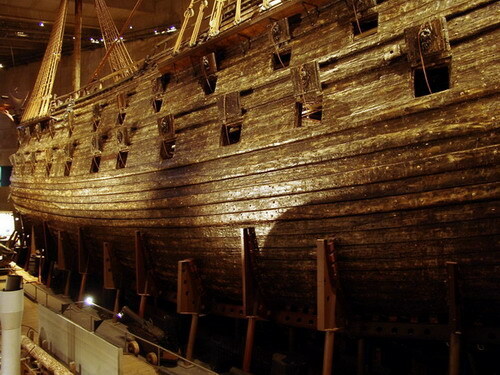 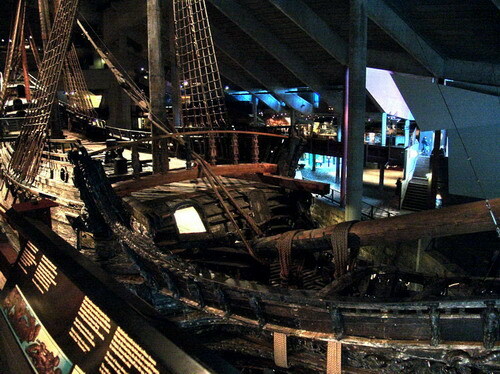 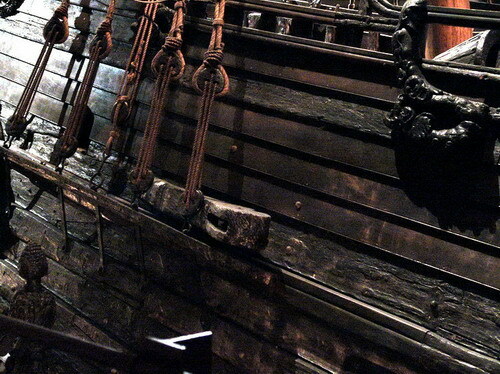 141 - The Vasamuseet shop sells an interesting 25 minute long DVD : The Warship Wasa.  142 to 145 - A few inner details. 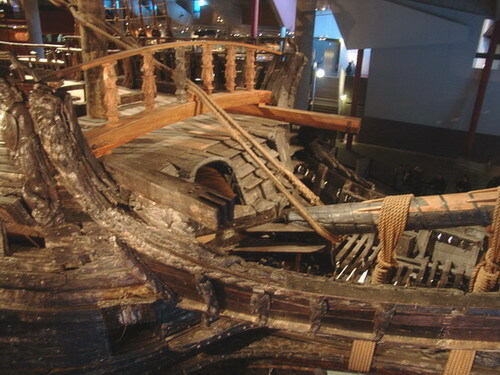 146 to 149 - Starboard side view. 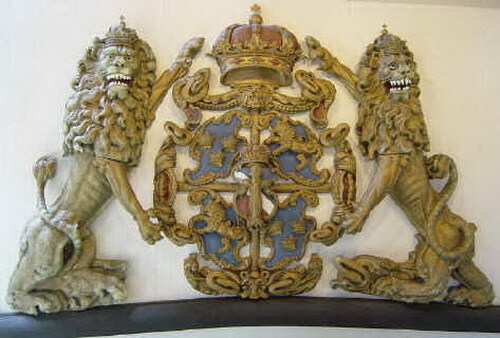 You can see the lions heads on the port-lids. 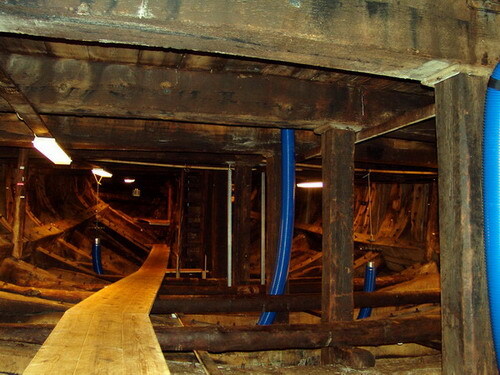 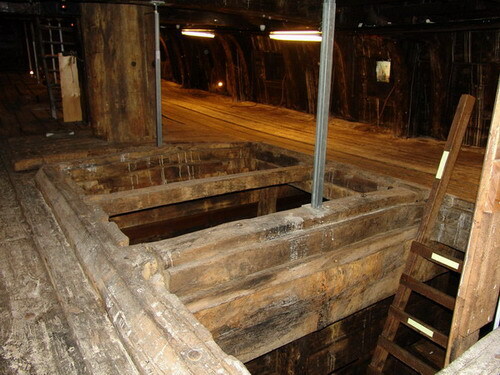 The walkway on the last picture is used to go into the ship. 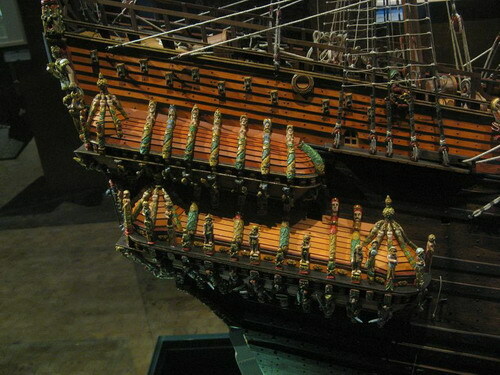 149 to 153 - Port different views. 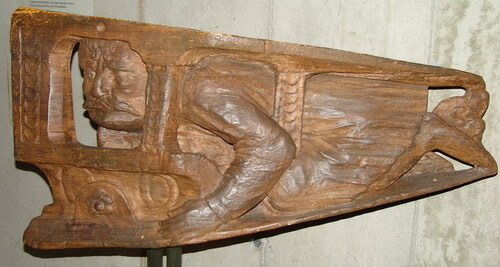 154 - You can see an empty space let by an emporor carving that was never found. 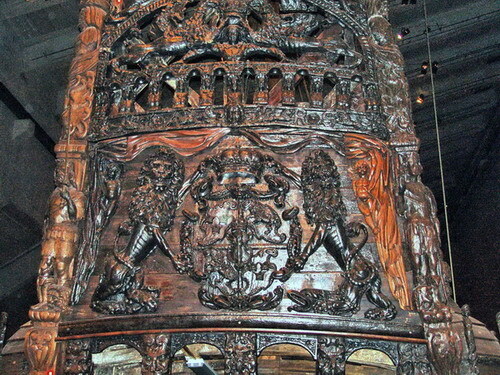 154 à 155 - Details of carving elements. 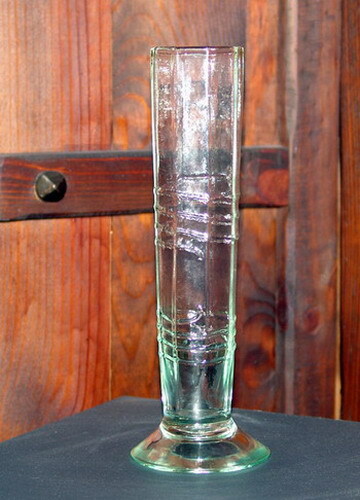 156 to 157 - A drink to the health of Wasa. 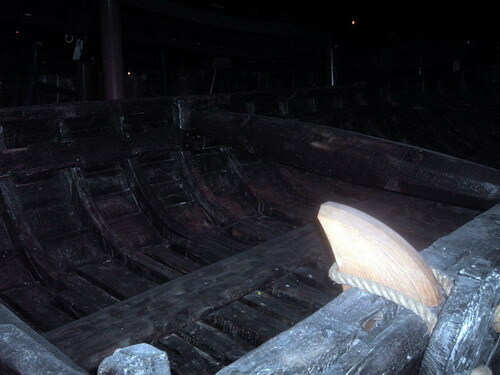 158 to 166 - Some pictures of the Wasa longboat. 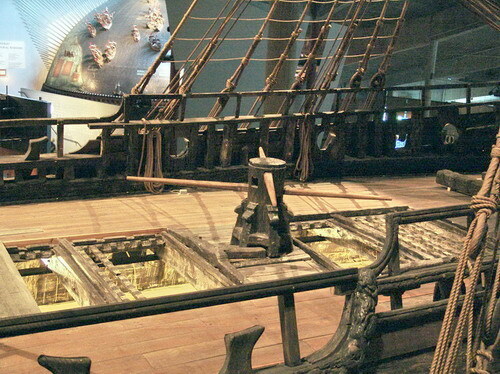 Parts of 6 ships boats were found around the wreck. 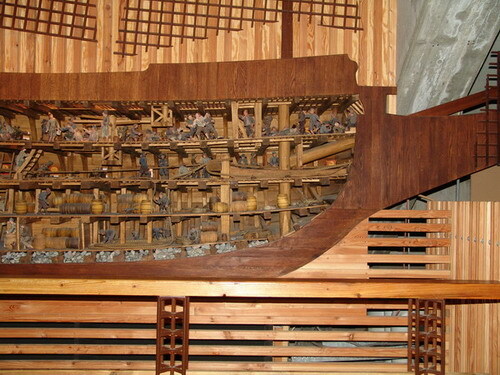 This is the only one from Wasa that has been rebuilt. 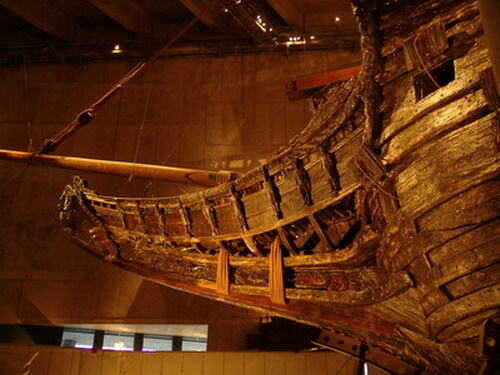 It is 12 meters long and can carry 12 people. 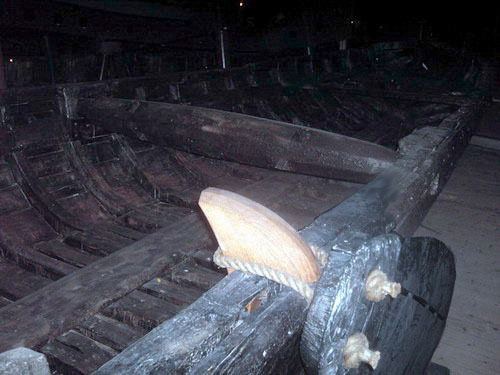 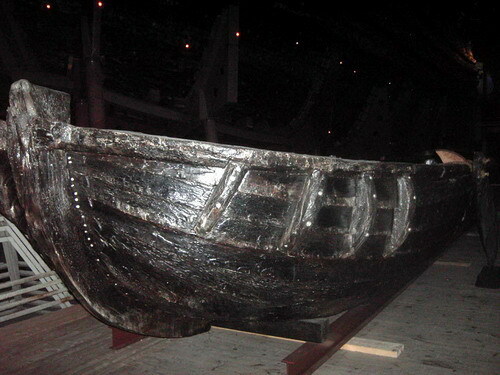 This longboat had been finished and used before the maiden voyage of Wasa. 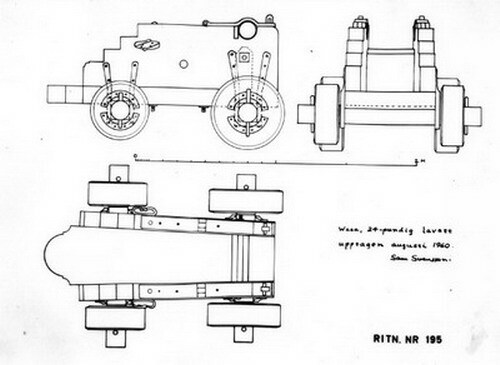 Thanks to Roberth for his help. 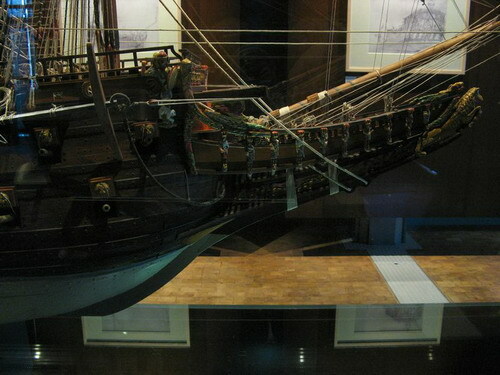 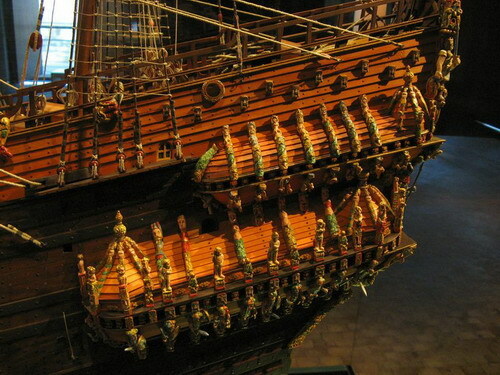 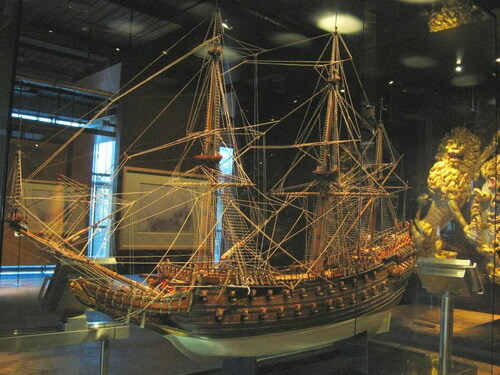 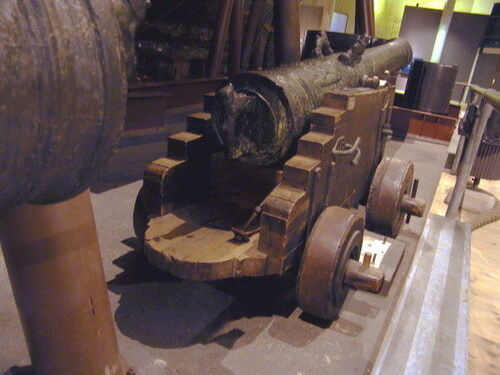 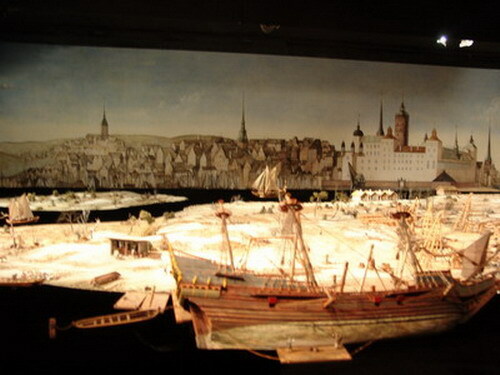 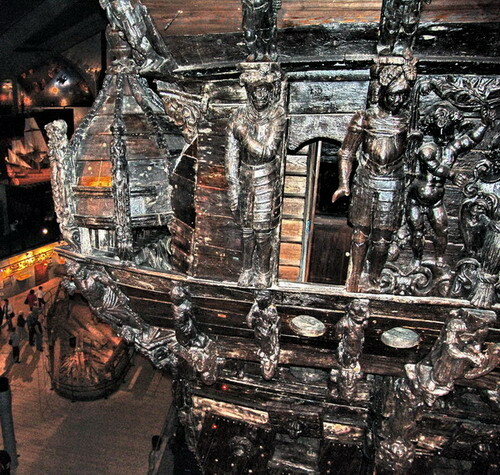 167 - General view of the 1/10 scale model of Wasa at Vasamuseet. 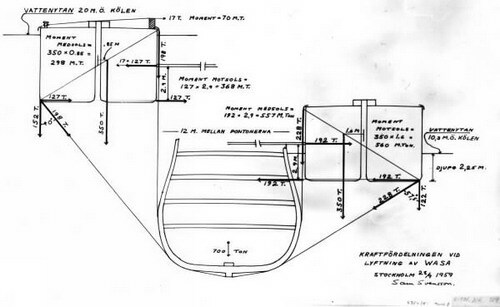 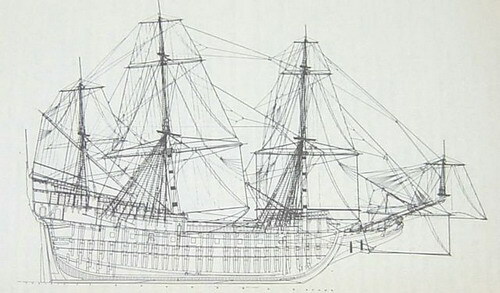 168 - A drawing of the stern of the Wasa at the same scale as a french 74 guns. 169 - If we line up the load waterlines, we can formulate questions!! 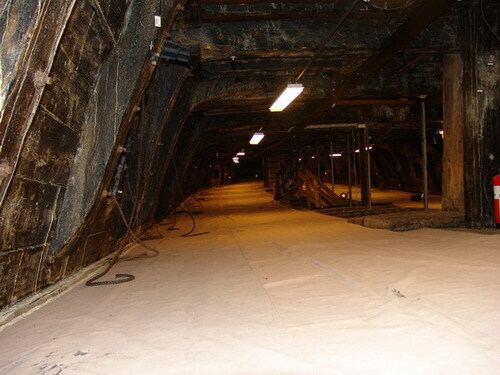 170/170b - A "message" gunport. 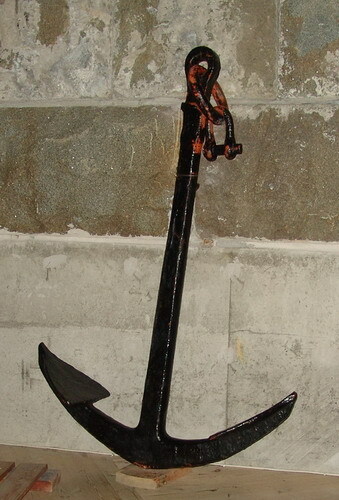 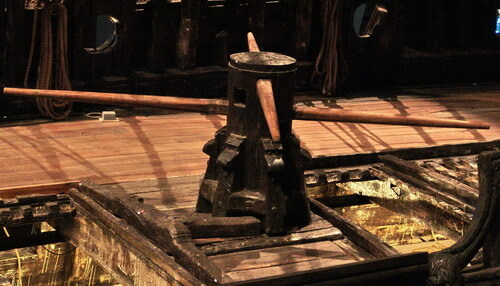 Used for taking on and discharging mail from the ship. 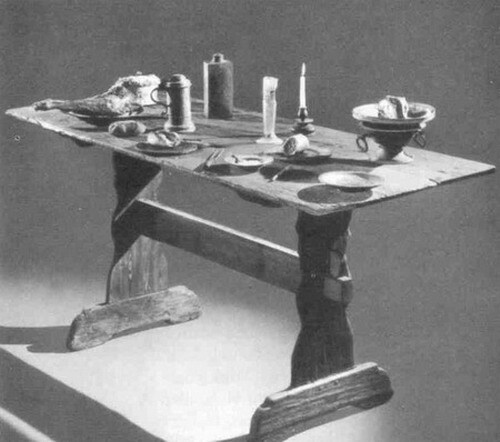 171 - Captain’s table with dishes and eating utensils found on board. 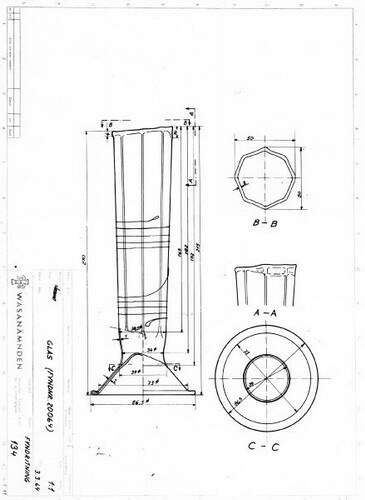 Notice the passglass from before in the middle of the table. 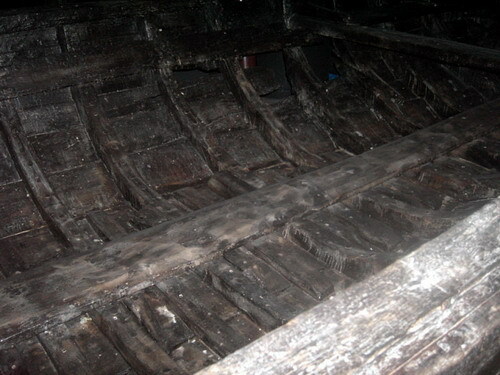 Butter was a find on Wasa that was in good condition. 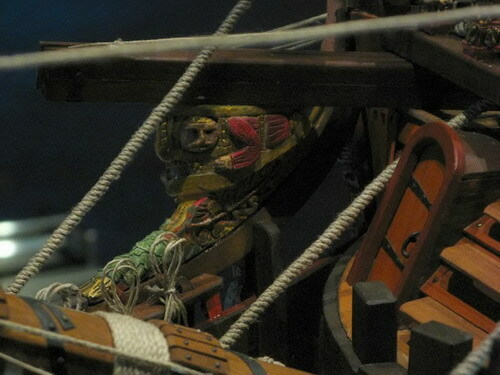 172 - Reconstruction of a sailor' face based on a skeleton and made with scientific police tools. 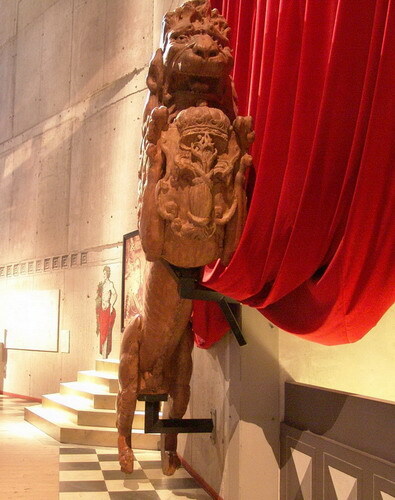 Man is shown at his actual size on a stand in the museum. 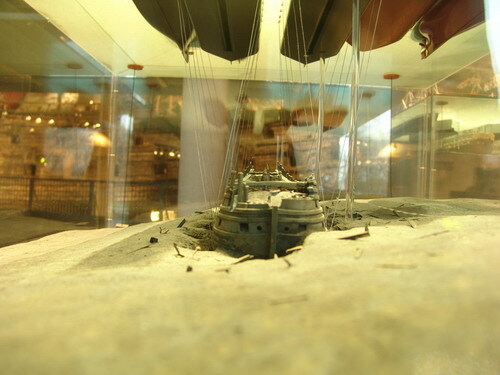 176 - Wasa model in the Berlin museum. 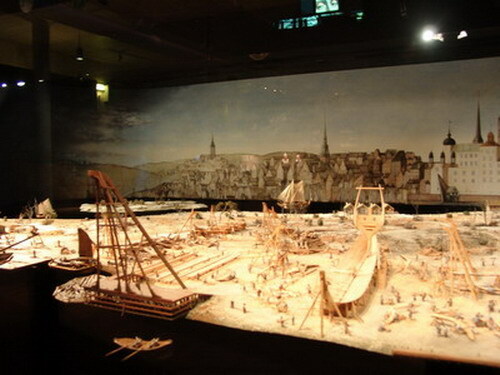 177 to 180 - Wasa model in the Berlin museum. 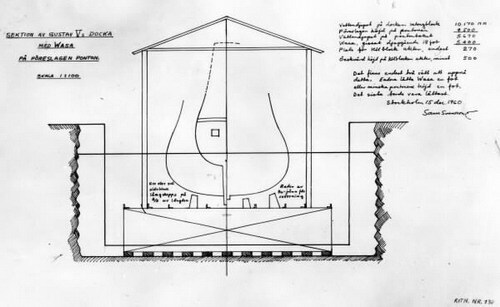 The Wasa was buit by two Dutch brothers nammed Hendrick and Arendt Hybertsson. 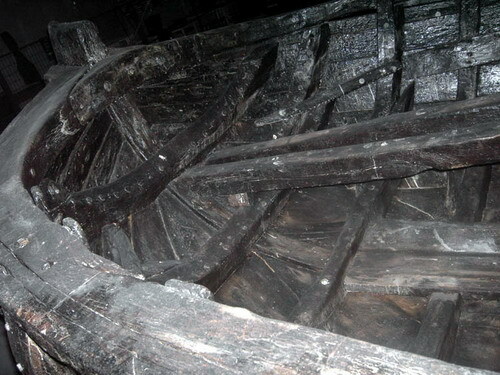 One died from an illness in 1627, before the maiden voyage of Wasa. 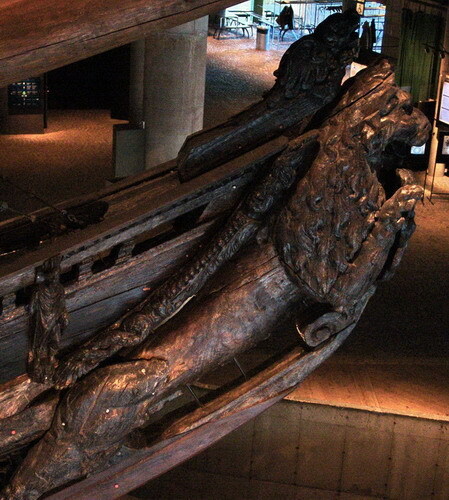 These two men were good workers and during the lawsuit of 1628, they were found to not be responsible for the sinking of the ship. 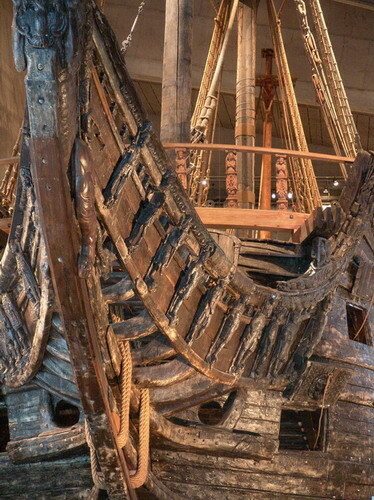 It was the Kings claim that they built the ship to be unseaworthy. 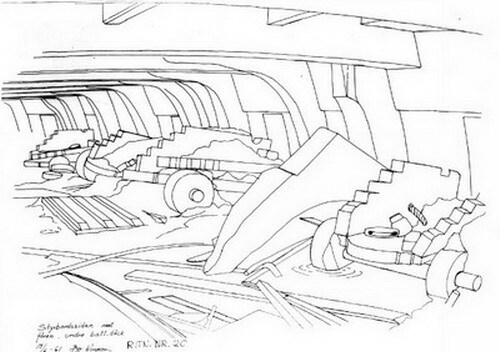 185 - A color symphony. 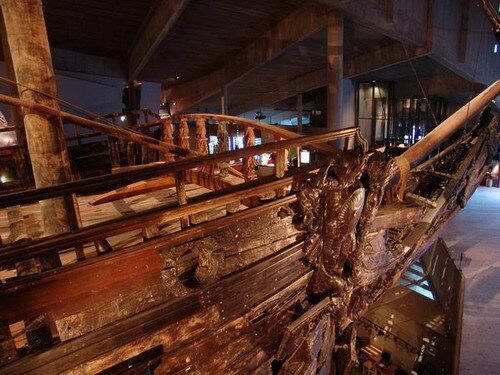 The magnificient views from each end of the ship and quarter galleries. 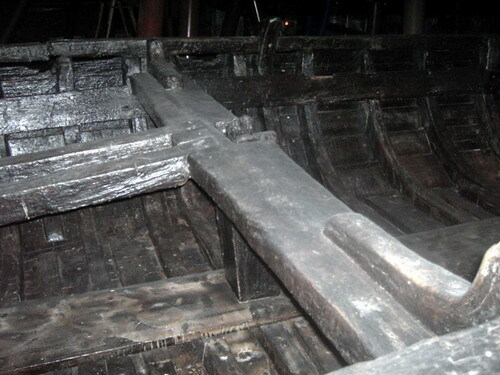 190 - A ¾ stern view. 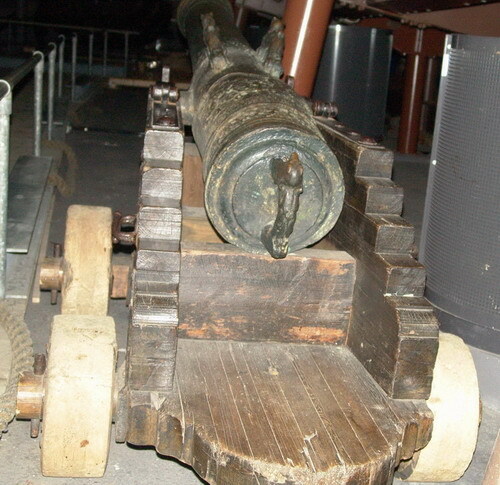 181 to 191 - Pictures from Berlin. 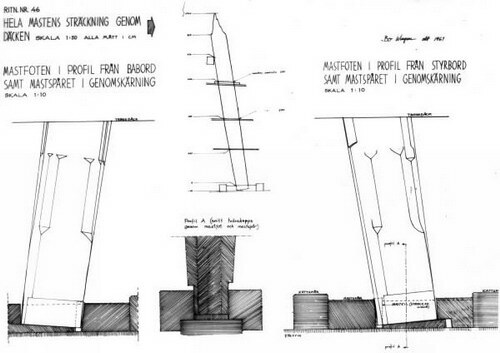 Thanks to Markus Leber. 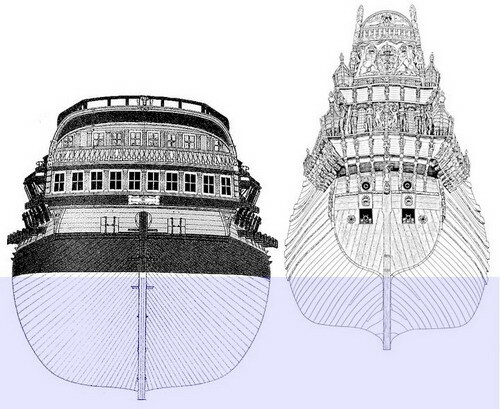 192 and 193 - Two pictures of Batavia + drawing to show similarities. 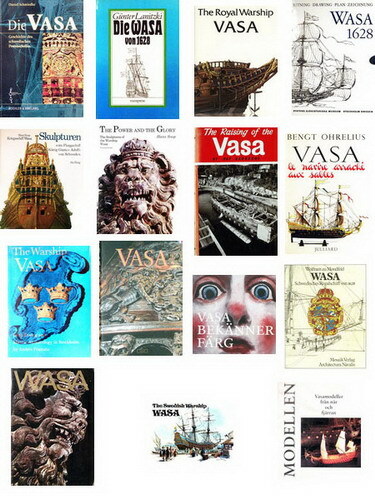 195 to 198 - Victor Yancovtich’s Wasa pictures. 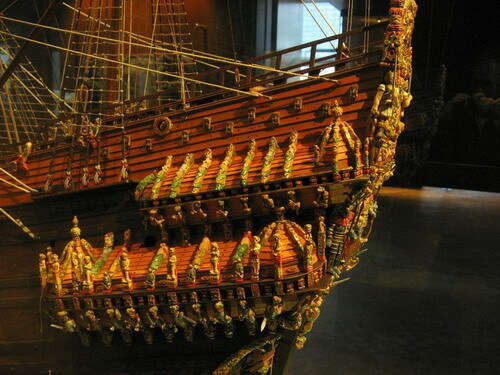 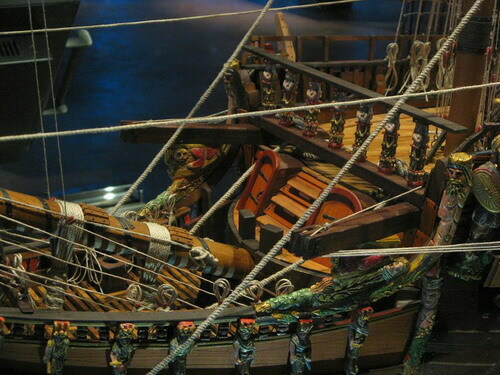 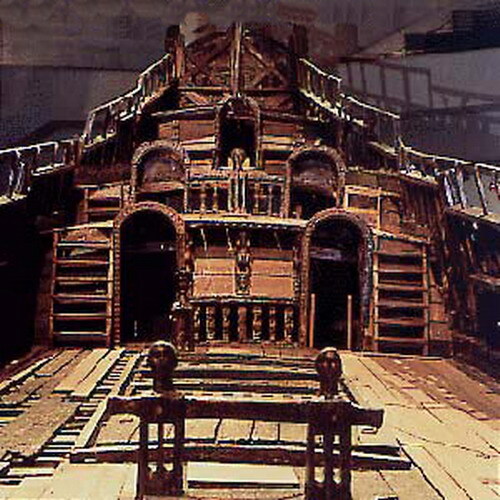 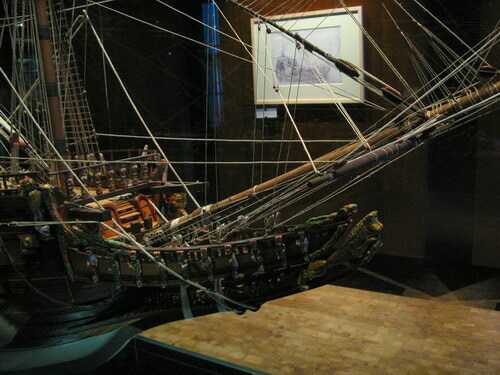 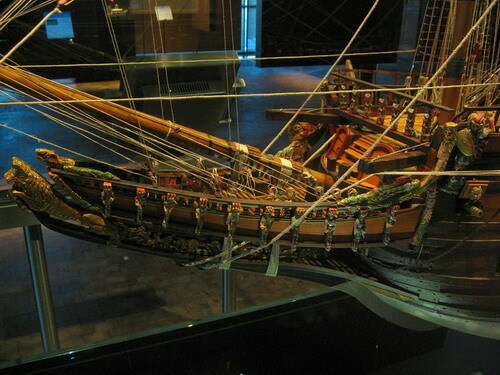 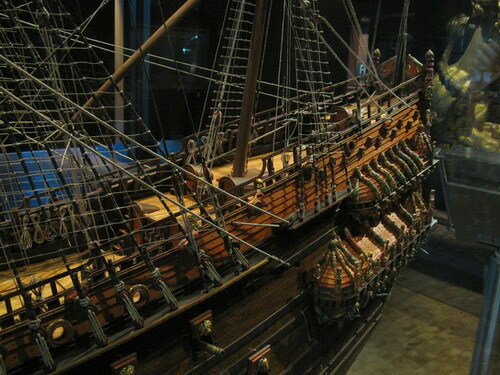 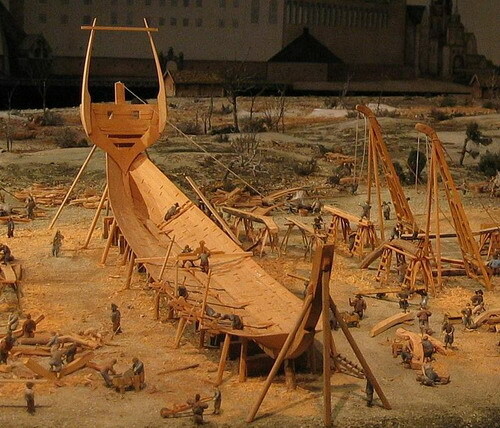 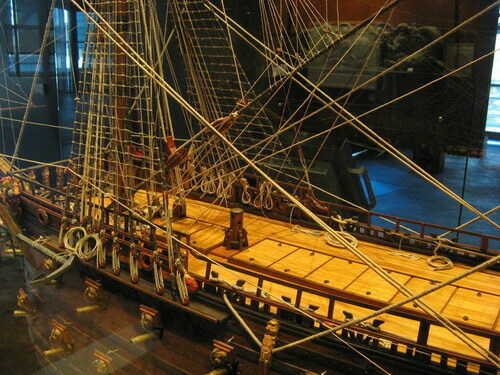 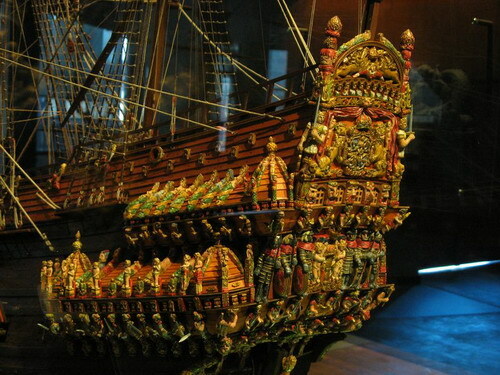 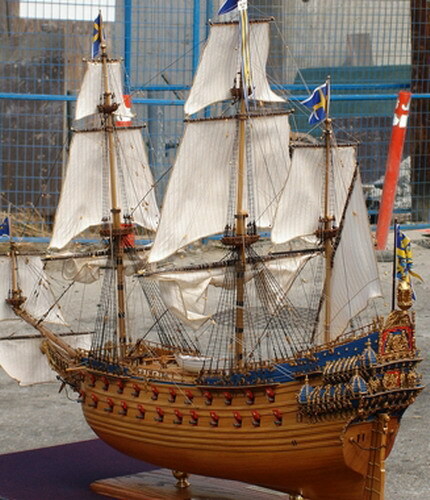 This model was built from the Vasamuseet drawings and was made with Sergal kit carvings. 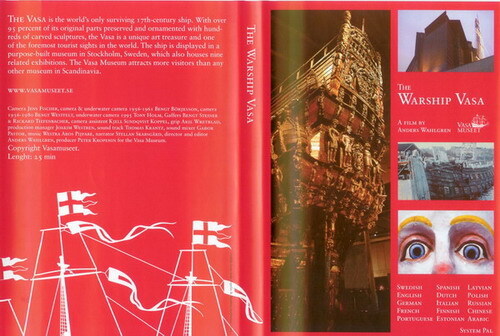 You can notice that legends about Wasa have long lives. 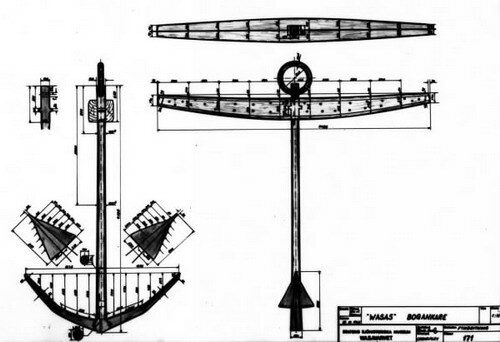 199 - Some views of the raising of the Wasa. 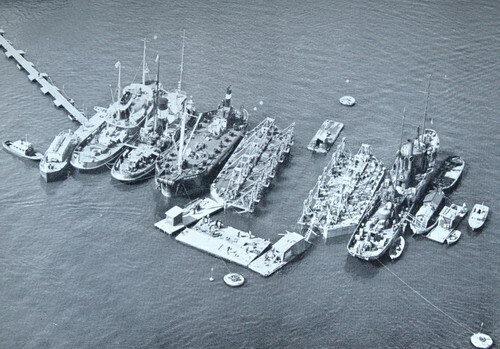 A picture showing the salvage fleet and the two pontoons of the Neptune company. 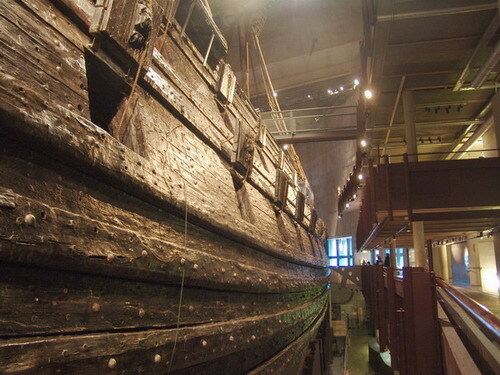 Oden and Frigg are positioned along the sides of Wasa which is still under water. 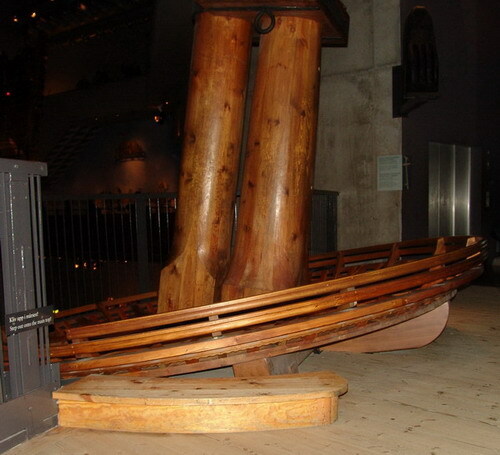 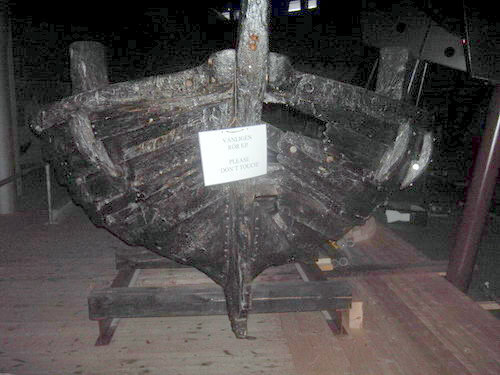 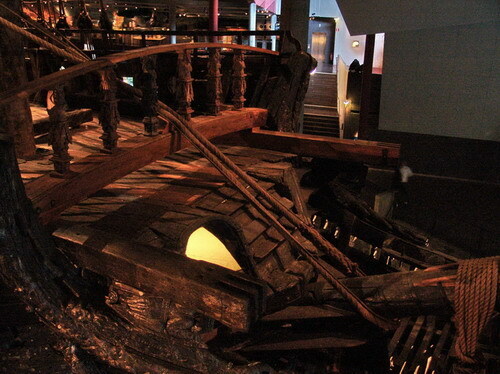 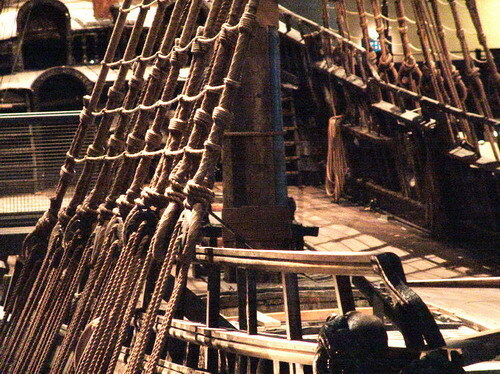 200 and 201 - Two pictures of the salvage operation in Vasamuseet. 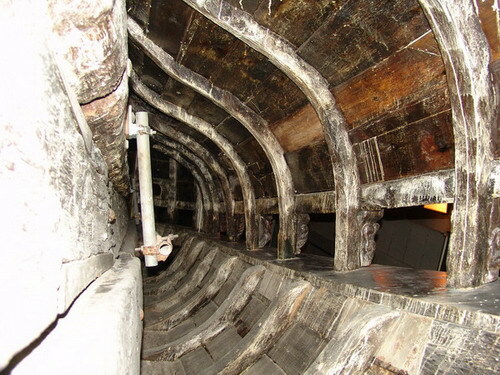 On the second photo, you can see the tunnels made by the divers who have taken risks to their personal well being in particularly difficult conditions. 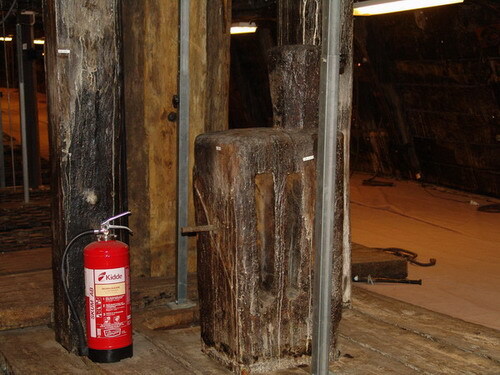 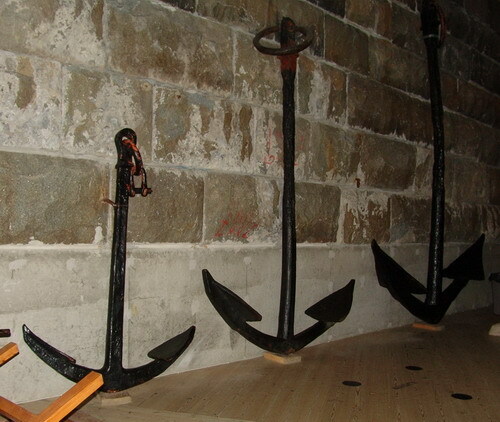 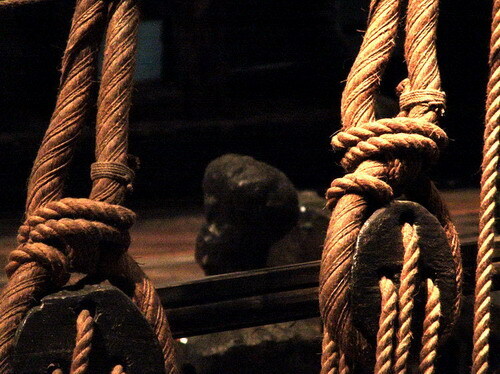 202 and 205 - The foor pictures are from the Vasamuseet archives that show the lifting system. 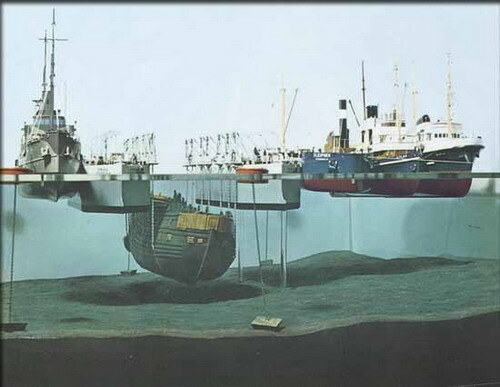 206 - A diorama of the lifting device. 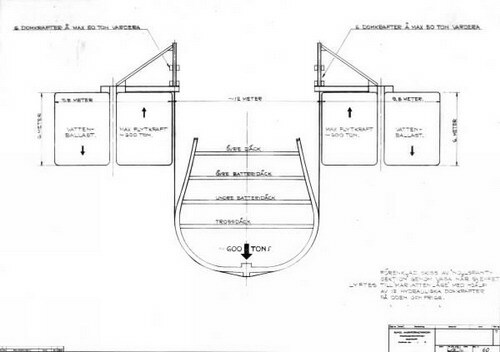 207 - Drawing explaining how the ship was raised in increments to shallower and shallower water in many lifts. 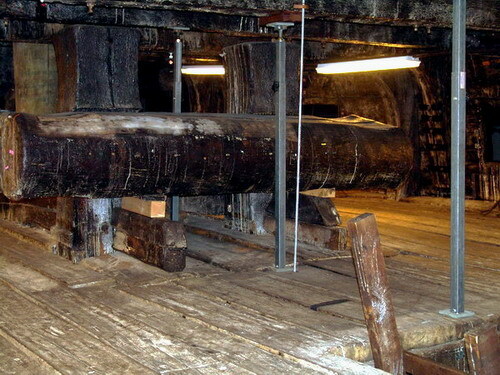 The raising of the Wasa was not possible in only one lift. 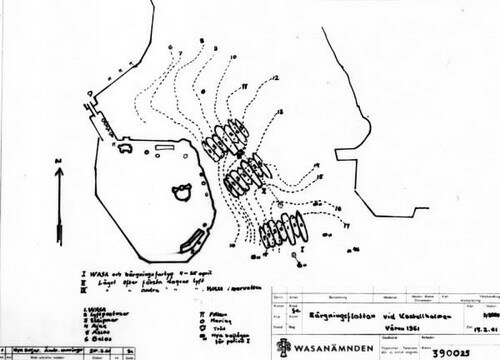 208 - Archive data showing the differents locations of the ship during the salvage. 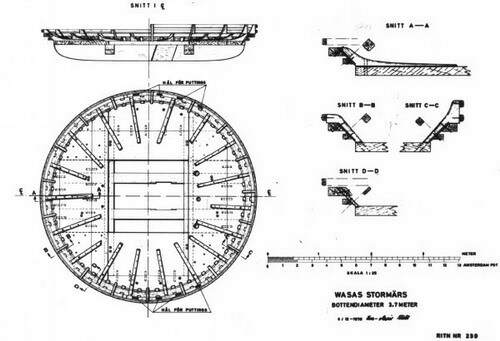 209 to 216 - Demonstration of the water jet lance (Zetterstrom-Jet) for the digging of the sling tunnels under Wasa. 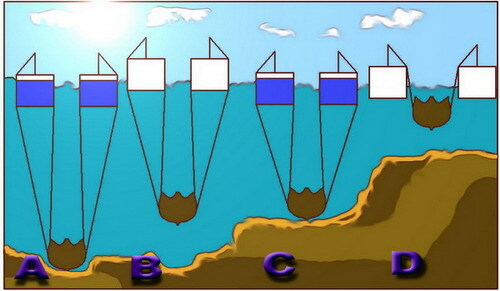 The principle of operation: a powerful water jet is directed forward to dig into the mud while discharge is directed backwards by the peripheral crown. 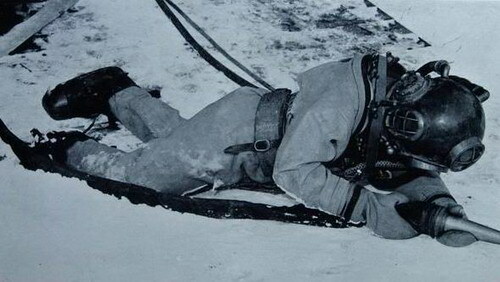 The divers worked in complete darkness in very cold water that was 30 meters deep. 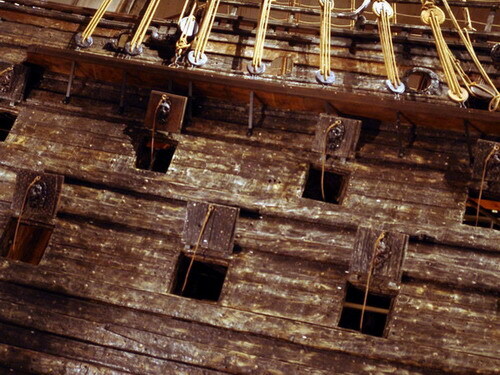 They risked the ship falling on them as they burrowed forward in a narrow tunnel while not knowing of the solidity that the surrounding material had to hold the ship up. 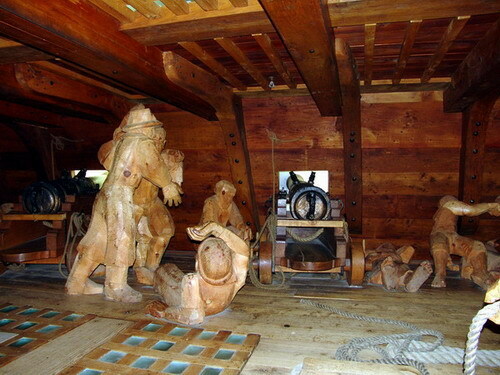 There are two fearful looking men crouching under small benches, one on the port side and the other on the starboard side at the bow. 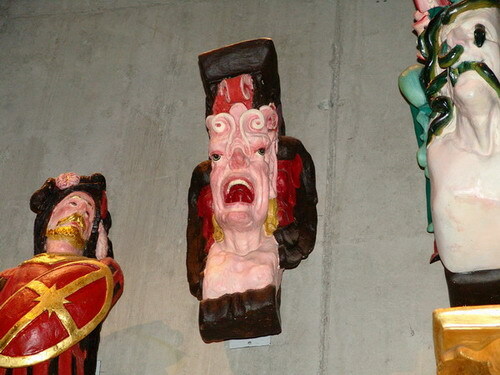 These two men are quite odd figures and are unlike any of the other sculptures on Wasa. 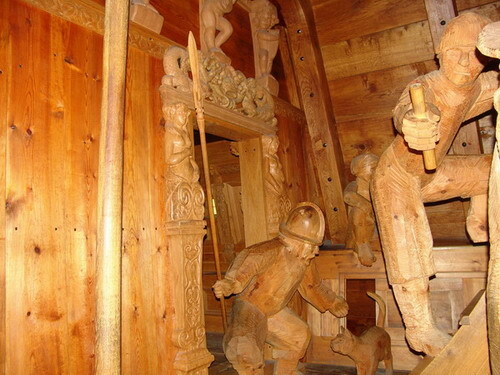 The men are Polish, which is clearly visible from their clothing and their facial features. 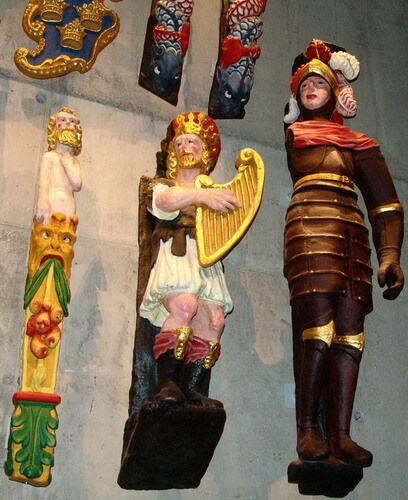 These sculptures refer to a Polish punishment practised in Poland at the time that took bad behaving or criminal men and forced them to crawl under a bench and bark like a dog, confessing their bad deeds. 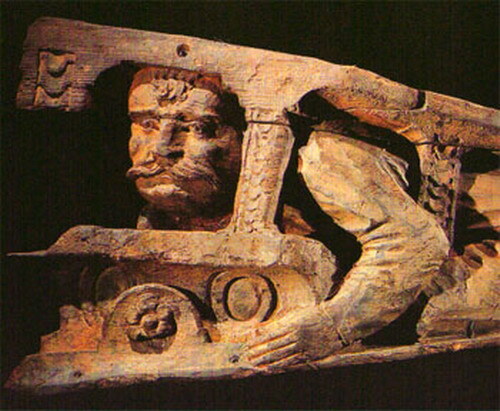 The proximity of these men to the Roman warriors suggest that unworthy Polish lives should be spared after showing their cowardice. 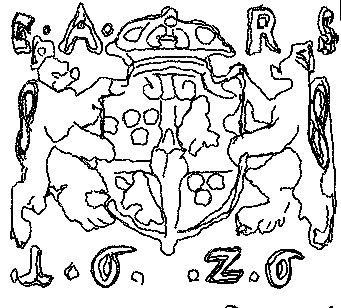 This is a very subtle way of humiliating Poland, the enemy. 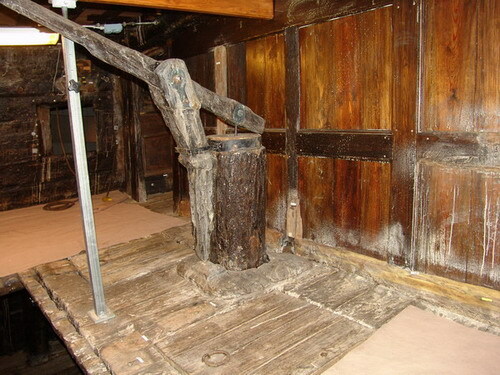 Also, when the crew used the beak-head as a toilet they had a clear view of the crounching Poles. 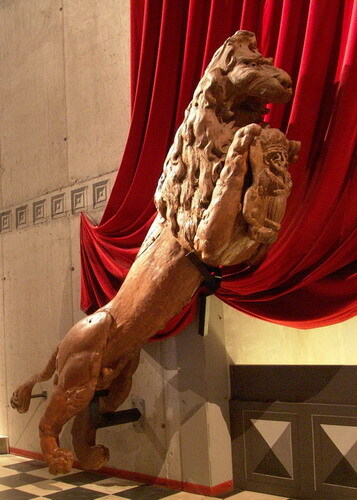 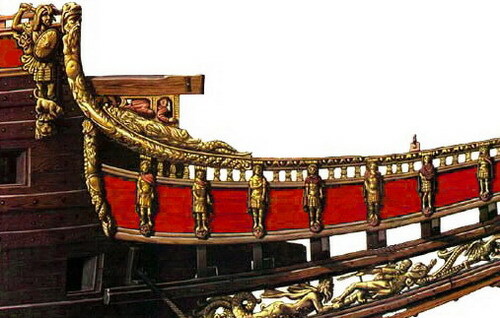 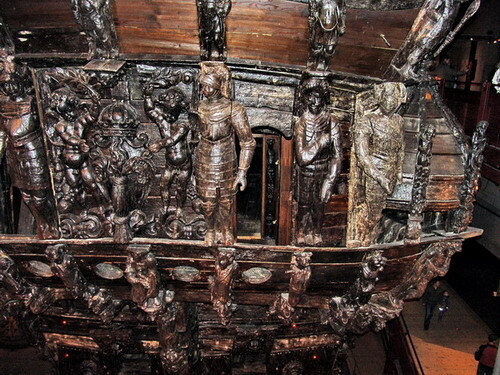 227 - Carvings of Roman Emperors stand in chronological order from the immediately aft of the figurehead to the stem. 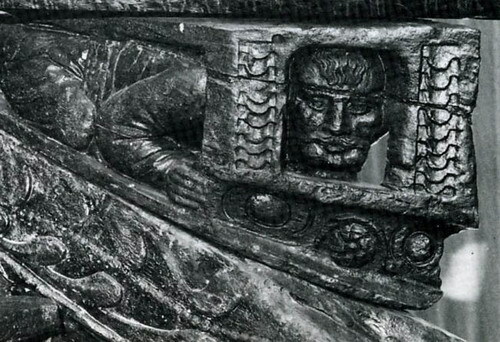 The first under the crouching Polish figures is Tiberius. 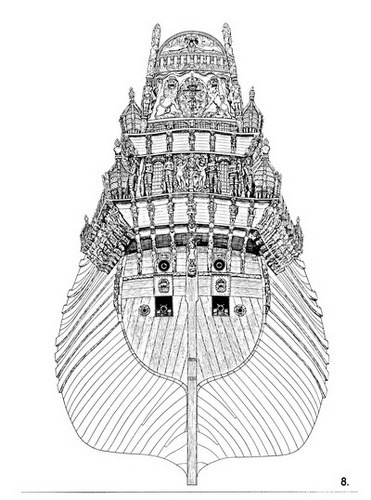 228 - The great lordly warrior. 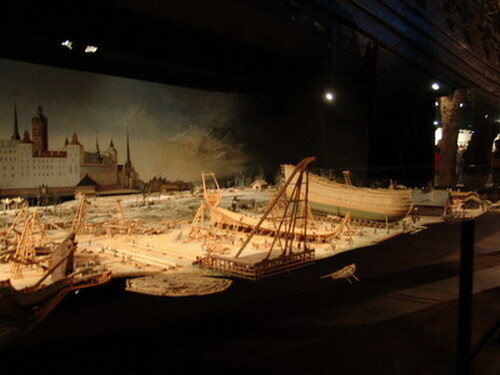 231 - Model at 1/1 scale of a Polish. 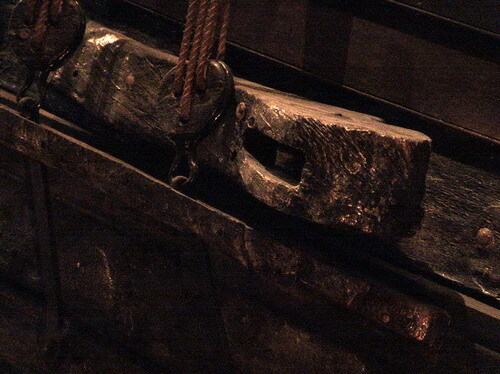 314 to 317 - Port spot of castle details. 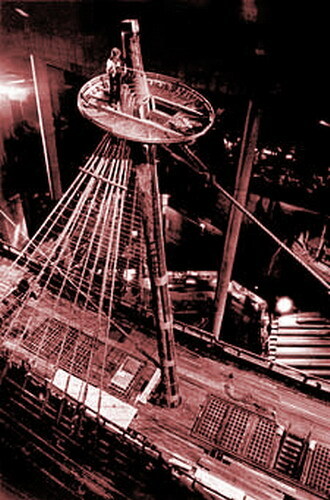 344 to 351 - Top of sterncastle. 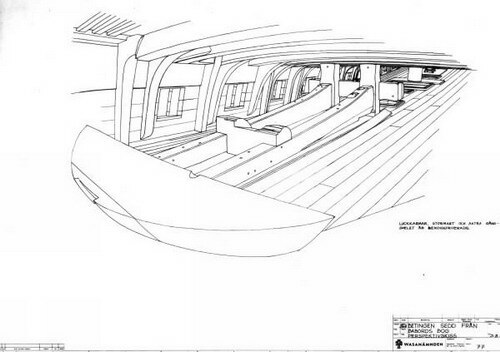 412 to 419 - Bow views. 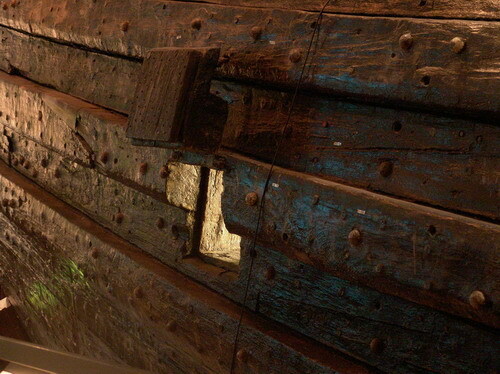 420 to 424 - Détails of port galleries. 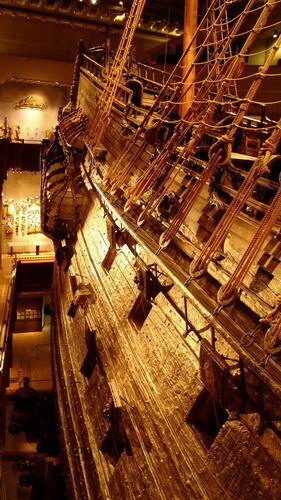 425 to 430 - Détails of starboard galleries. 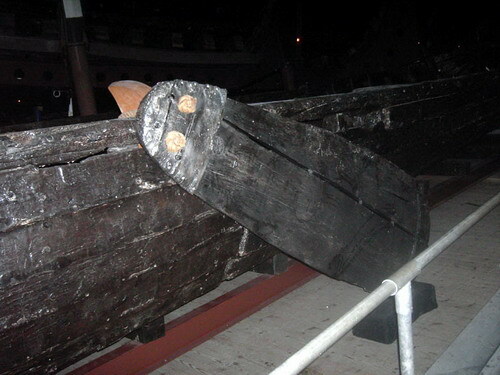 433 to 437 - Gunports détails. 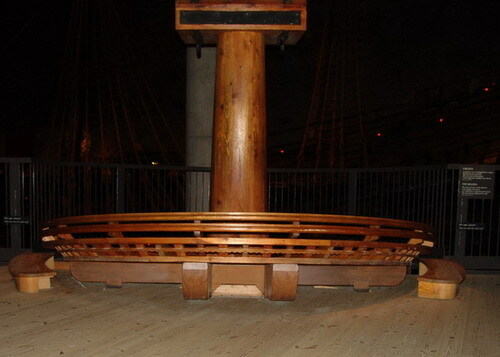 440 to 459 - Weather deck views. 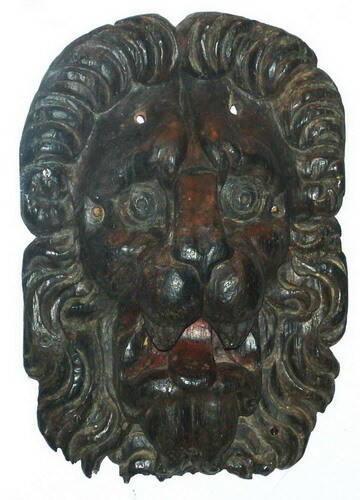 461 to 465 - Lion figurehead. 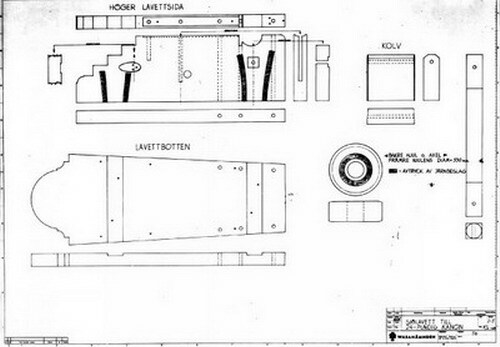 469 to 472 - Maintop. 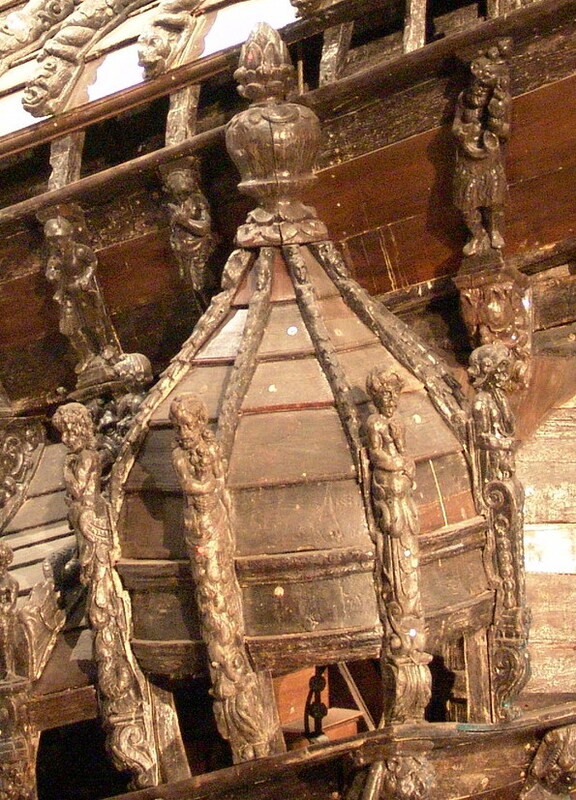 475 and 476 - Capstan. 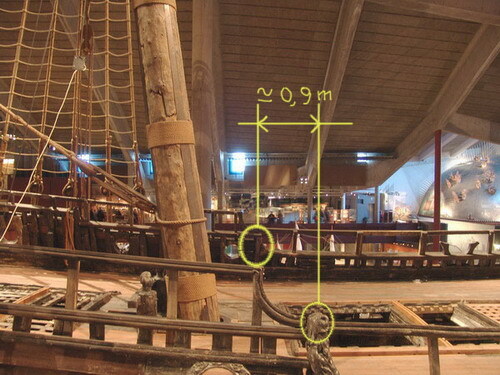 We can see that this ship was very large for this period. 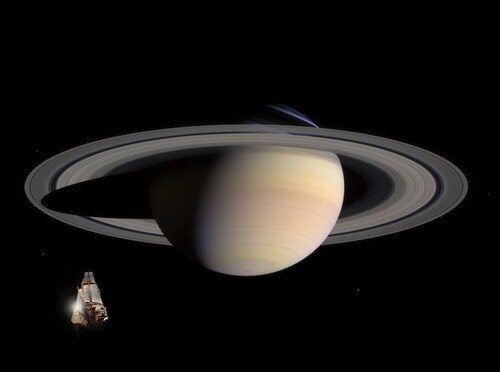 I invite you to view the website of my friend Clayton. 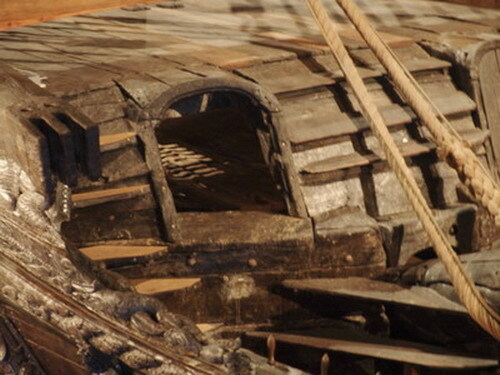 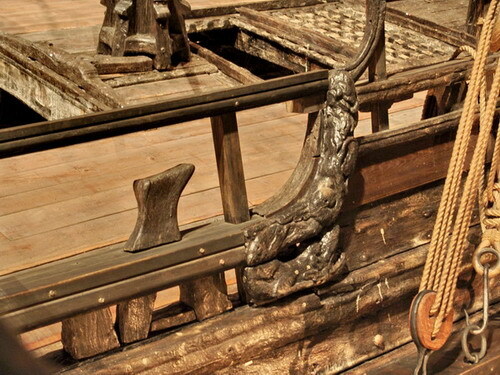 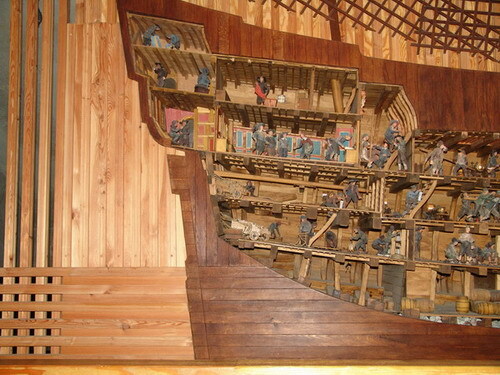 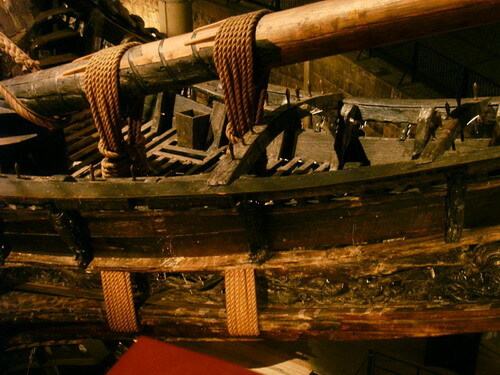 He tries what is rare: to carry out a model of Wasa that has a fully framed hull.The frames of this ship are not completely known and he is being advised by Fred Hocker, Director of Research at Vasamuseet. 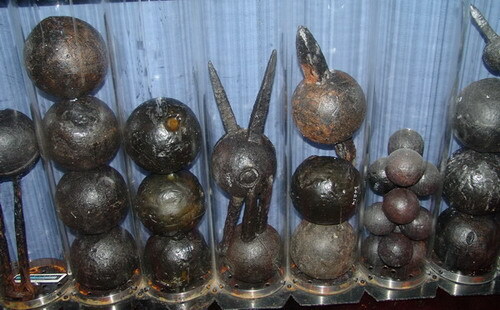 It is a very interesting experiment. 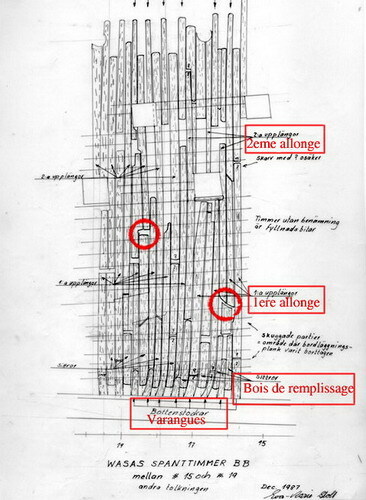 Photographs and texts were extracted from a report carried out by Herve Sasso on the Wasa forum of Gerard Delacroix.